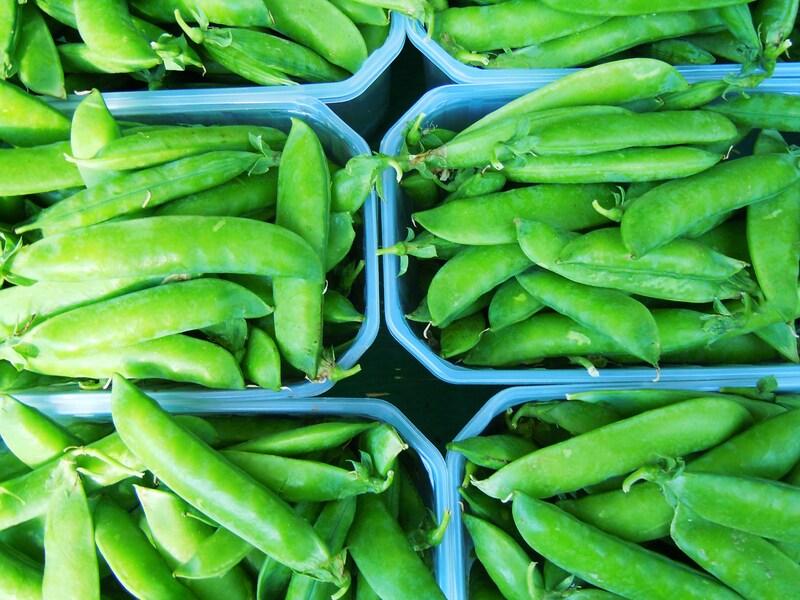 Beautiful green space, some of the most amazing perogies in the city, and row upon row of juicy fruits and vegetables in every colour of the rainbow – this is the summer market at Mel Lastman Square! 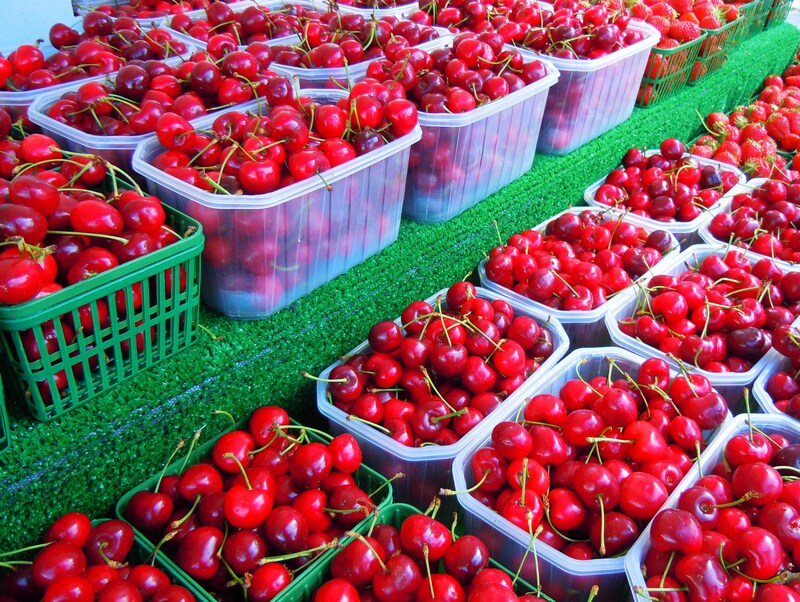 This market was truly one of my all-time favourites last summer, one that I would have visited every single week if I had the time and opportunity. I LOVE how accessible this market is. 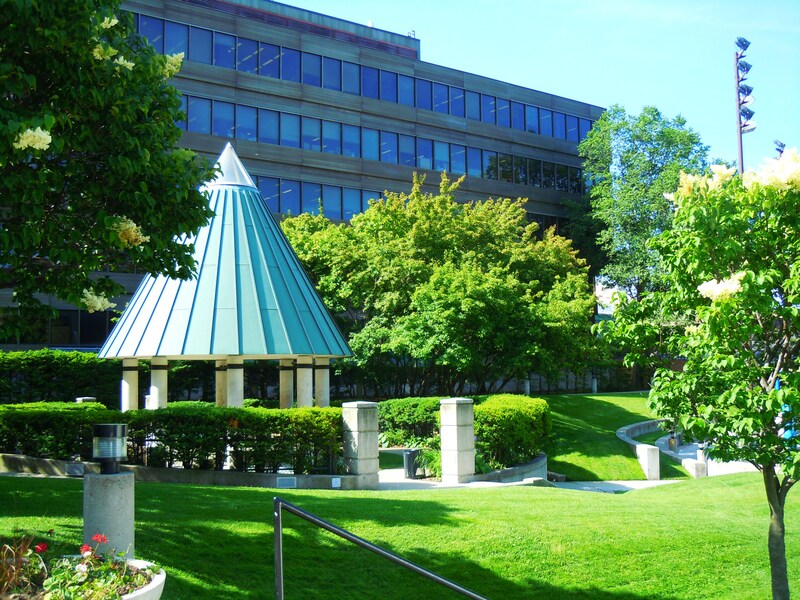 Right off the North York Centre subway station on Yonge St., it’s walking distance from both Sheppard and Finch (which works great for me since all I have to do is hop on a Viva bus from my neck of the woods in Markham! ), there’s ample space to enjoy the food you end up buying should you choose to stuff your face right then and there, and – this is a shopaholic and foodie in my gushing – there is SO many eats to explore in the area including Korean grocery and dining spots, tea and dessert cafes, noodle houses, and more. The market is situated in a bustling, busy part of town and yet it affords all market goers with plenty of peace and quiet on park grounds, which I can’t get enough of. The fabulous potato and cheese perogies that I love so dearly from Taste of Russia were back for another market season, as well as some of the baked goods and hot food vendors. I was delighted to find out that BreadSong Collective was vendoring (I know this is technically not a word, but it works in this context so humour me!) at North York this summer and did they ever bring their A-game! Using Monforte Dairy cheese, fiddlehead galette pastries were made along with little cake loaves and large creme fraiche galettes made with Ontario strawberries. 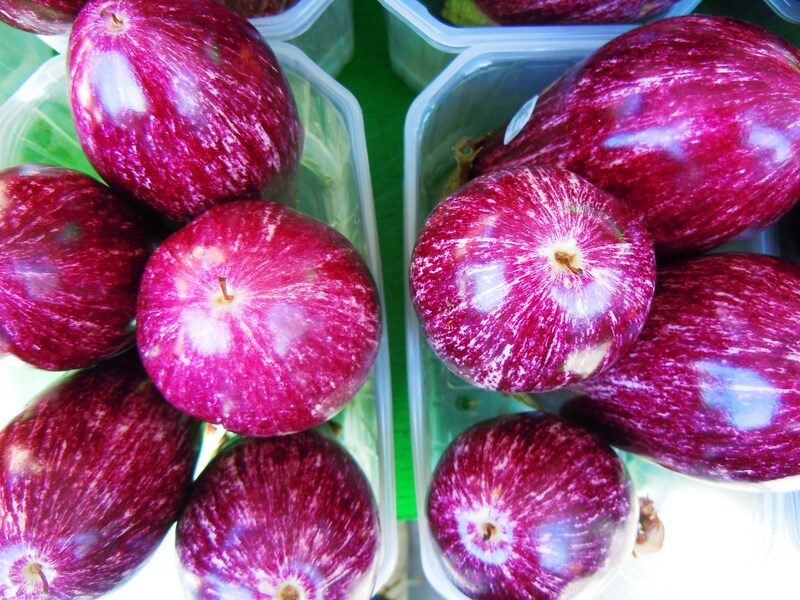 There were beautiful peppers, zucchinis, strawberries, root vegetables, and these drop dead gorgeous baby eggplants that were a lighter shade of purple streaked with white, like sunbursts and fireworks. 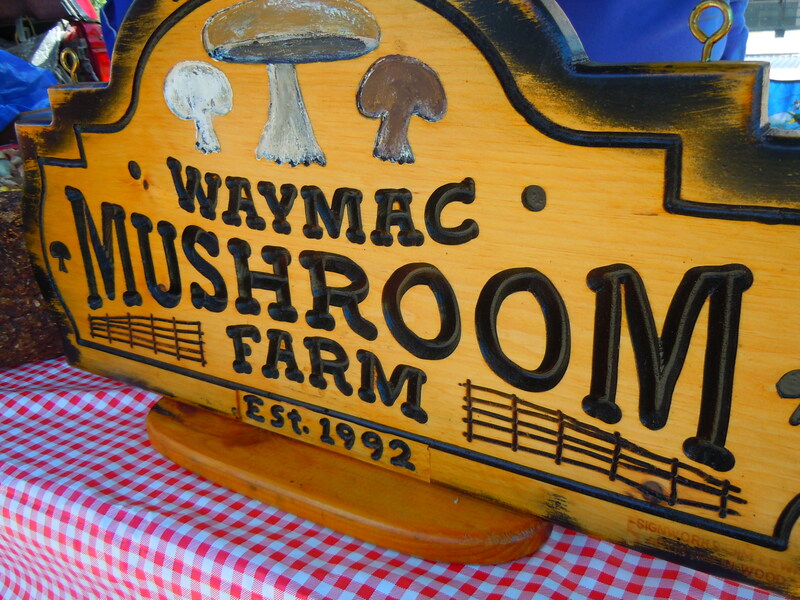 Waymac Mushroom Farm (who are also vendors at other local Ontario markets in Peterborough and Port Perry) was on hand with beautiful oyster, shittake, and portobello mushrooms and, one of my new favourites, Joy of Harvest! 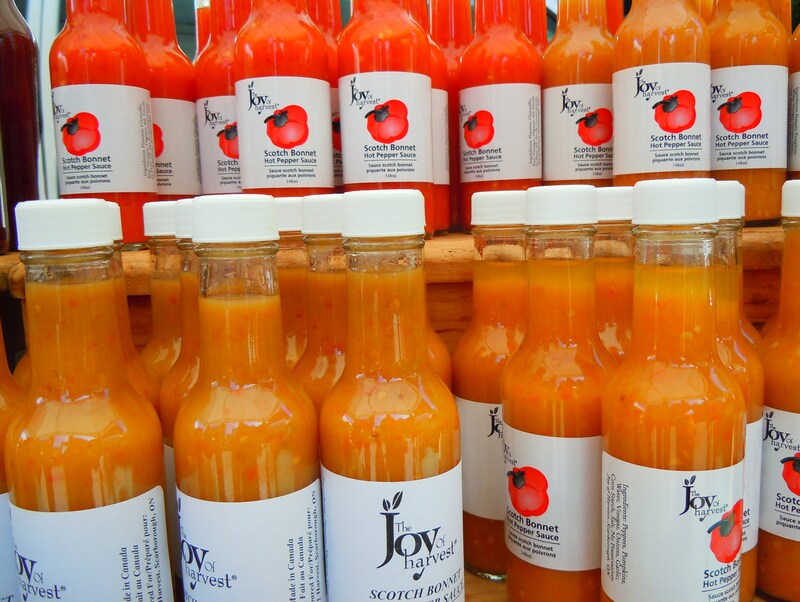 Calvin and Sonya run this fab condiment business, specifically selling their products at farmers’ markets. Products range from chutneys (the mango one is delicious!) 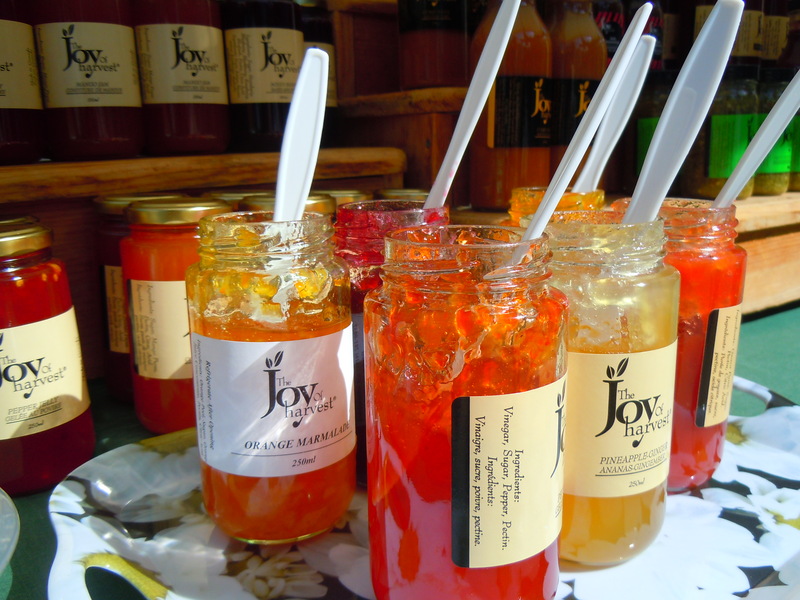 to hot sauces, curry sauce, jerk seasoning, and exotic fruit jellies and jams including guava and pineapple ginger! Let’s just say my pantry yearns for all of these. 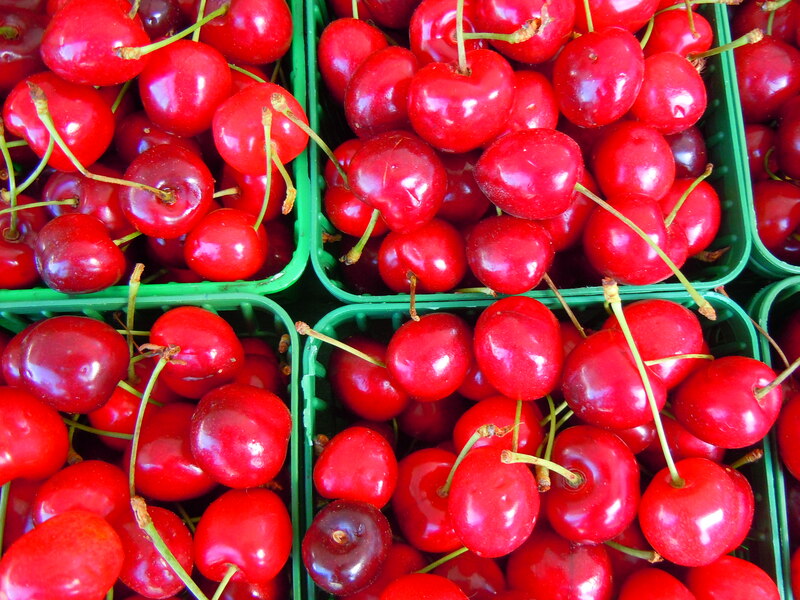 I love the variety the North York Centre market affords because it’s one of those markets that you can feasibly do all your grocery shopping at! There’s bread, meats, fruits, vegetables, cheeses, pantry items, and hot food and regardless of whether or not you would actually go through with buying an entire week’s worth of groceries here, it’s just nice to know you could if you wanted to. My picks are definitely the black bean and kale empanadas by BreadSong, the perogies by Taste of Russia, a sauce, jelly, or chutney by Joy of Harvest, and any of the baby vegetables like the baby eggplants and baby zucchini. 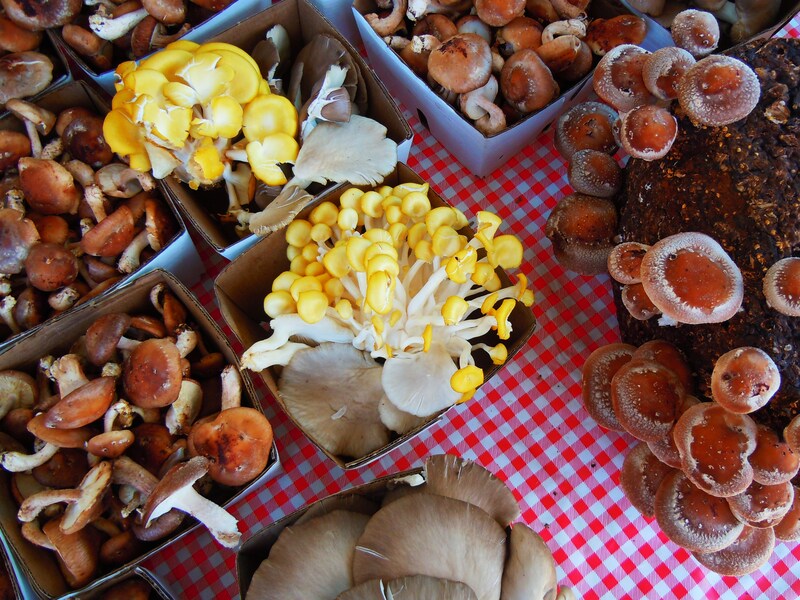 If you make it out to the market, stay around for the whole morning; it’ll be worth it. 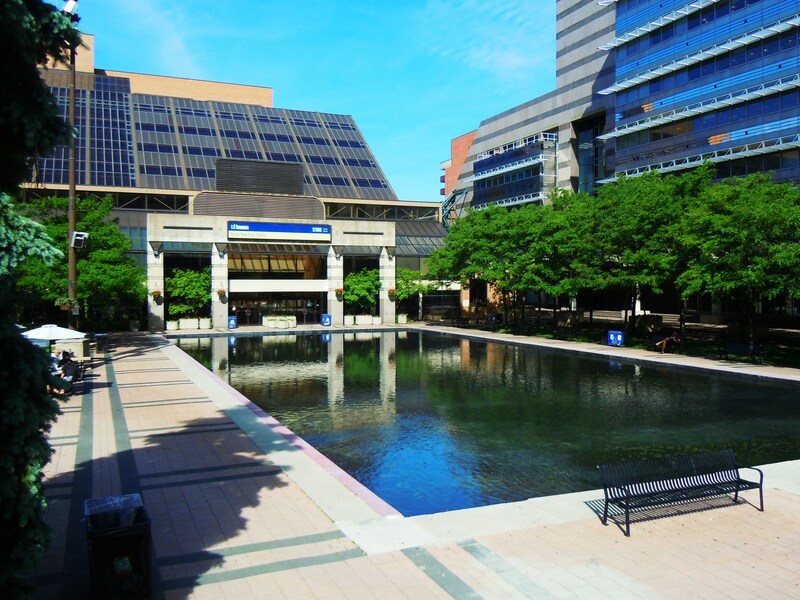 The North York farmers’ market by the North York Civic Centre at Mel Lastman Square is located at 5100 Yonge St. just across the street from the North York Centre subway station off Hillcrest Ave. 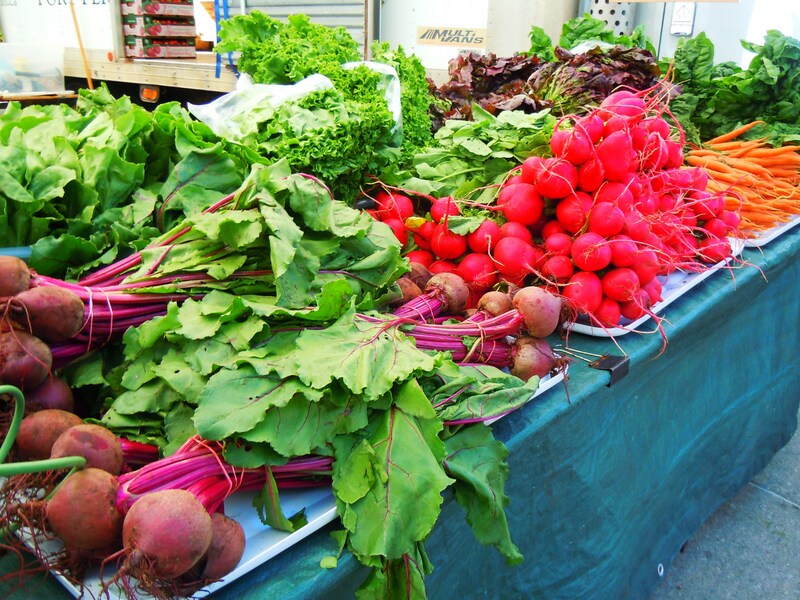 The farmers’ market is located on the west side of Yonge St. and runs every Thursday from 8am-2:30pm from May 31st to October 25th. 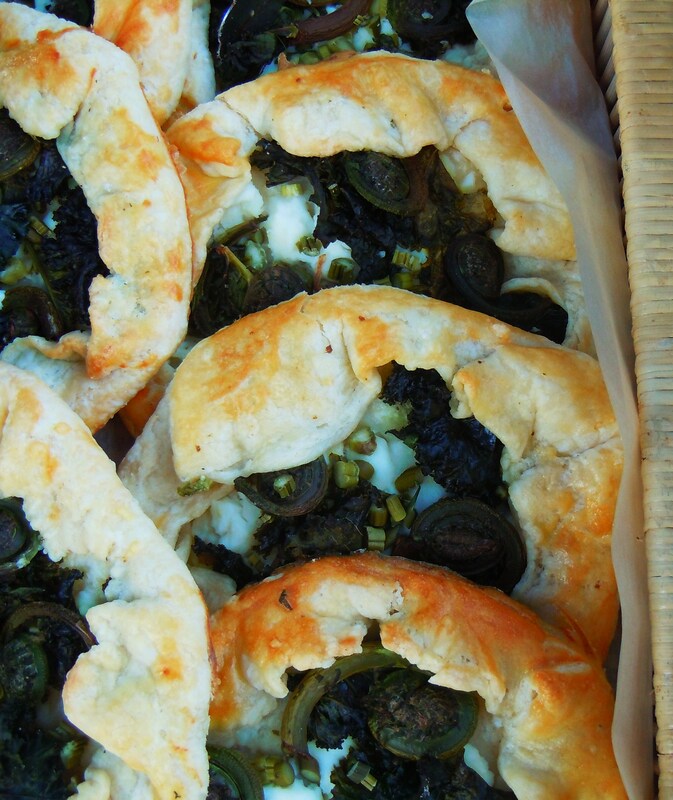 Fiddlehead galettes with Monforte cheese by Breadsong Collective! Lunch just keeps getting better and better. 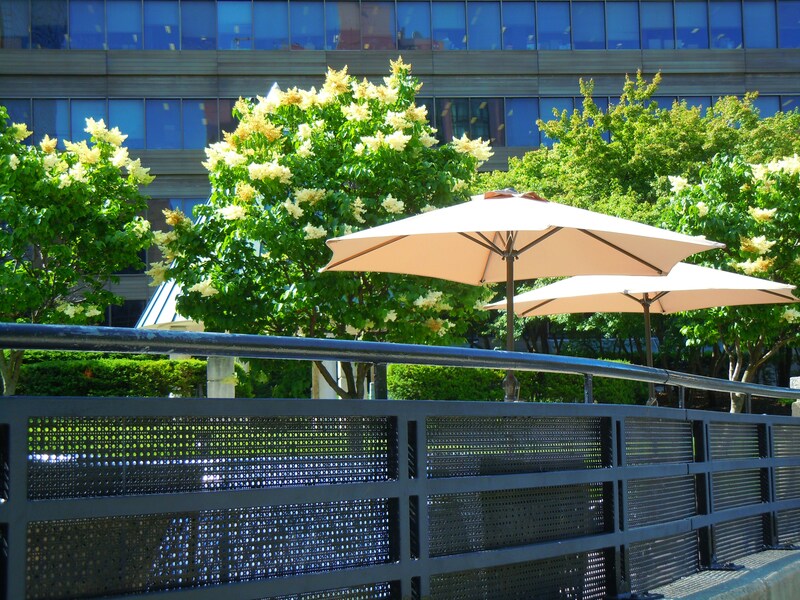 With Toronto Lunchtime Office Markets to look forward to and an infinite number of sushi bar lunch specials to tick off the list one by one, lunch is at its finest. I’ve always loved looking through sushi bar menus (100 items?! That should keep me occupied for awhile! ), but ever since I started the Sushi Lunch Special series last month with Sushi Sky, I’ve been paying extra, careful attention to menus with the best lunch special variety and deals. I’ve even spent some afternoons in the last month just browsing take-out menus and doing online searches with The Food Network on tv in the background. Obsessed? I prefer to call it enthusiasism. Over the past few weeks I’ve come across a handful of new sushi places (new to me, not new to the city) in North York and west Eglinton that I’m so excited to eventually try, thanks to the nice weather and my walking shoes that took me around different neighbourhoods in town. But I have to hand it to the online community for introducing me to unchartered territories and by online community, I mean the e-mails that flood my inbox every single day. Let it be known that I subscribe to almost every single collective buying site: Groupon, Living Social, Dealfind, Team Buy, you name it, I’ve probably subscribed to it. Regardless of whether or not I’m interested in anything I receive in my inbox, it’s an amazing resource. I know there are mixed feelings and opinions concerning the politics of doing business this way, but at the very least, these sites have really helped me get to know businesses I never would have been aware of otherwise. Each time I see something I might be interested in revisiting in the future, I tuck the e-mail away in a special folder to review at a later date. 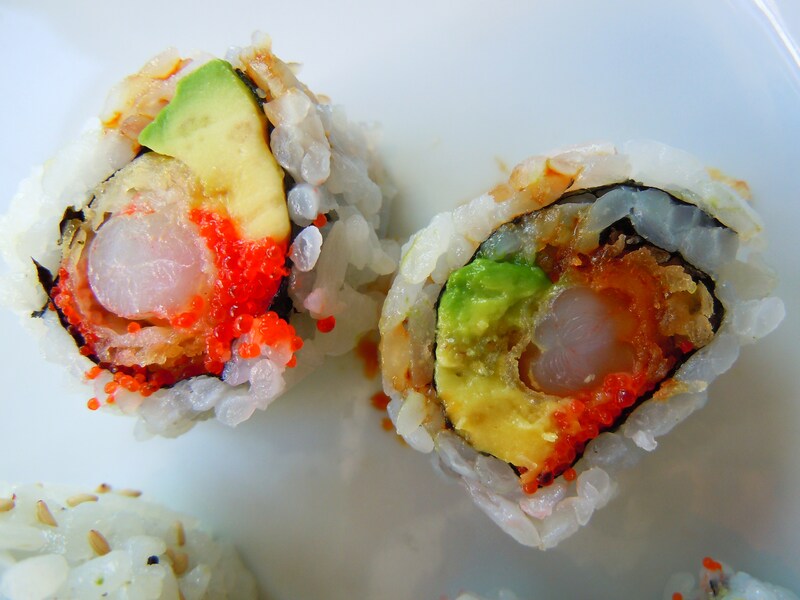 Thanks to Dealfind, Sushi One caught my eye as a prospective place to check out. Thus, lunch at Sushi One has been a long time coming. A REALLY long time. Since LAST MARCH long time. I was shocked out of my pants when I went back to give the e-mail I had saved a quick once-over and saw the date of the e-mail: March 24, 2011. Good god. I know I take my sweet time getting to certain spots (it’s a big city! ), but this is embarrassing. Oh well. I least I have a delicious sushi lunch to show you all now. 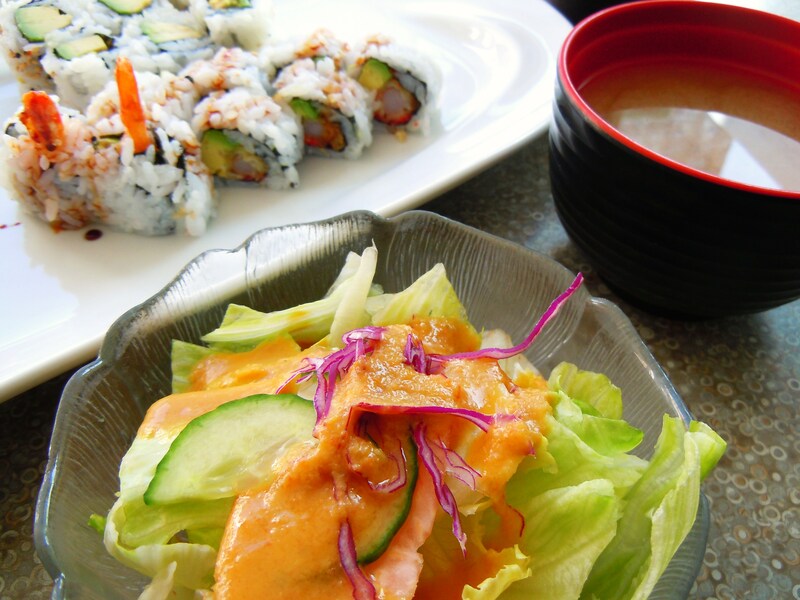 Sushi One, located on Yonge Street in North York just north of Sheppard Ave., is a fabulous sushi lunch spot. Not only are their lunch special prices enticing, their selection is to die for. We’re talking 10 sushi roll combinations, 12 Japanese rice and noodle options, and 6 special lunch combos. That’s 28 items alone and that’s not even scratching the surface of their regular dine-in menu. I thought Sushi Sky‘s lunch special deals couldn’t be beat but I was wrong. While I still stand by the lunch meal set I had (soup, salad, 12 rolls, and 2 salmon sashimi cakes) at Sushi Sky as being in the Top 5 best and The Sushi Shop as my absolute favourite spot for rolls, Sushi One’s selection and prices are out of this world (21 items ring in at only $6.50) and I would have to come here at least another 6 times just to try all the ones I’m in love with. My hit list includes the curry mushroom rice, curry tofu rice, mushroom udon in soup, the maki lunch bento, the salmon lover lunch, and the mushroom udon with sushi lunch. 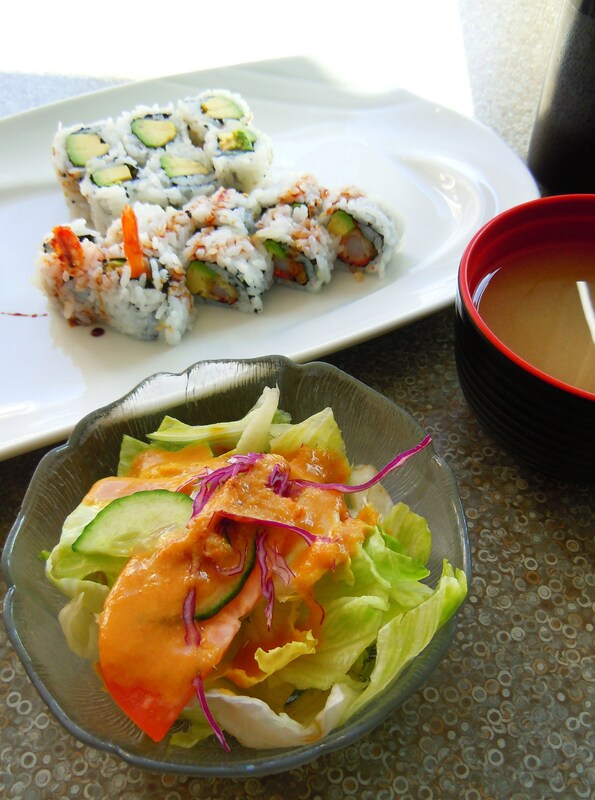 What I have for you all today: the simple, yet delicious, dynamite and avocado roll lunch special set. Sushi One has 10 different roll combinations as part of their lunch special menu and what makes these sets so appealing is the price combined with amount of rolls. 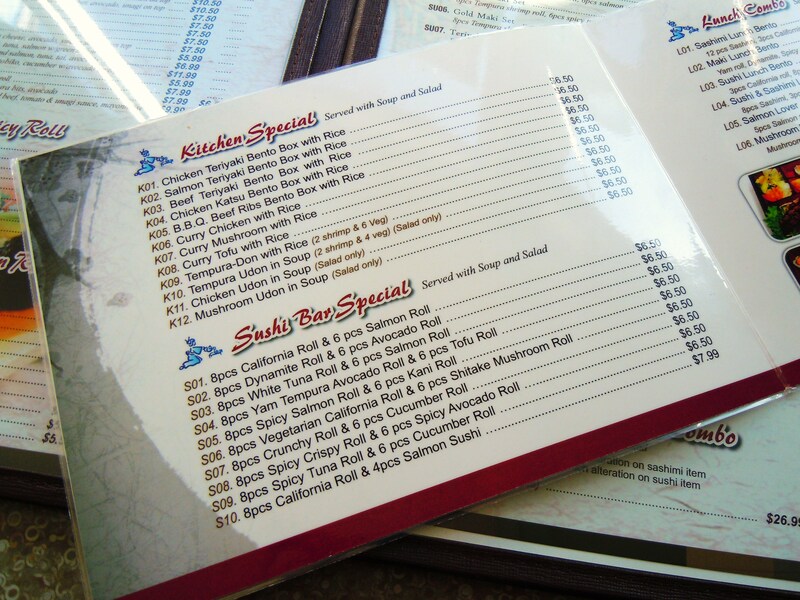 With the exception of one item, all rice, noodle, and roll meal sets in the lunch special menu are priced at $6.50. Half of Sushi Sky’s lunch menu comes in at $6.99 and Sushi on Bloor has theirs at the same price point, so $6.50 is ridiculously reasonable in the context of sushi. Furthermore, their roll sets come with 14 rolls as opposed to 12, which is the amount many and most places offer. The rolls at Sushi One aren’t the largest, mind you, (that award goes to Sushi on Bloor’s lunch rolls) but they’re delicious and of good quality so that’s what I take away from it. Almost all their lunch specials include soup and salad (a few of the larger sets come with one or the other as opposed to both) and while I know salad is probably nothing to get to excited about, I love the salad that comes with sushi lunch specials. They’re always so fresh and crunchy and made with the yummiest mix of Thousand Island dressing and vinegar at most places. 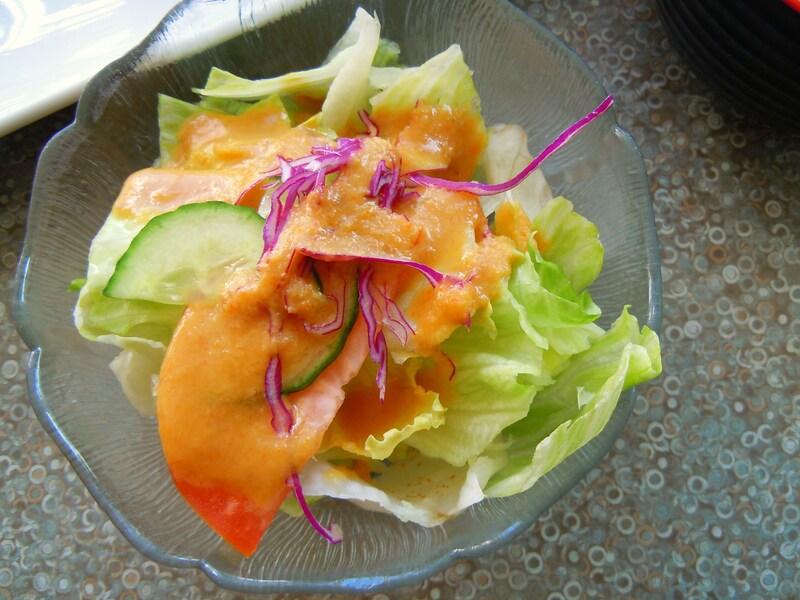 I know, I go out for sushi and I get excited about the salad! It’s a highlight worth mentioning though! 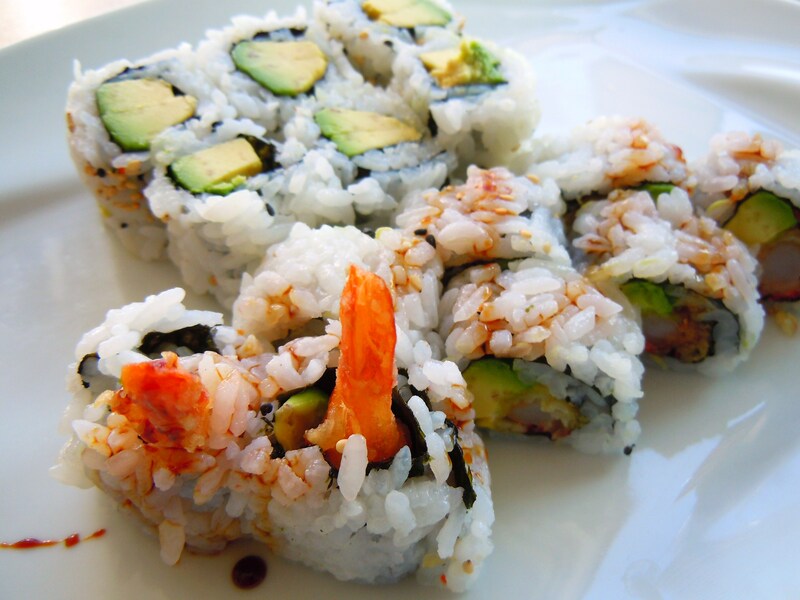 In terms of the rolls, the great thing about Sushi One’s rolls is that they aren’t overloaded with sushi rice. It’s a necessary component, yes, but it’s a turn-off when you’re given rolls that are disproportionately made with rice as opposed to filling. It’s the filling that you are primarily paying for and when you’re stiffed in that manner, it just doesn’t sit well. Their rolls were drizzled with a sweet sauce that gave the rolls a mix of sweet and savoury flavour and all the rolls were incredibly soft. It’s a great sushi spot and one of the best for lunch for more than one person because you can totally go crazy and mix and match for the purposes of sharing without blowing up your wallet. 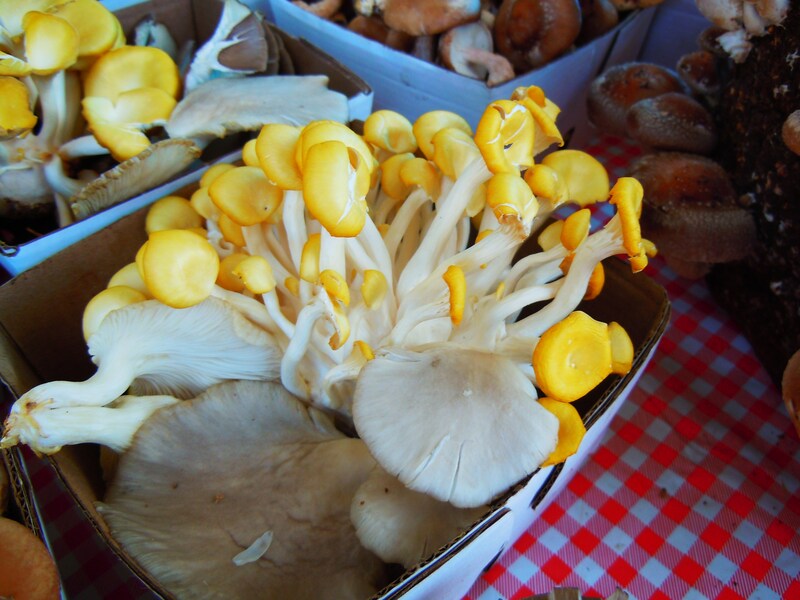 I am beyond excited to go back and inhale a bowl of curry mushroom rice or mushroom udon in the near future! 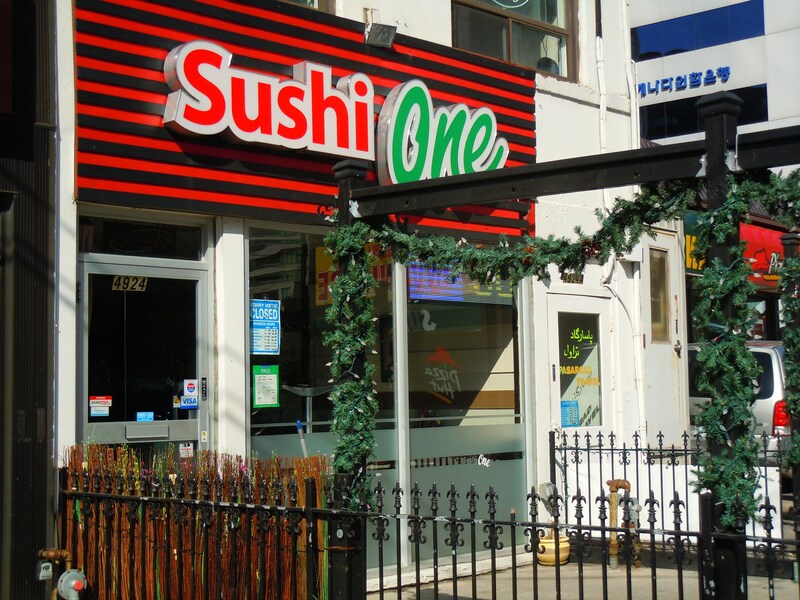 Sushi One is located at 4924 Yonge Street in North York on the west side of Yonge, north of Elmhurst Ave., in between North York Centre and Sheppard subway stations. From Monday-Friday they are open at 11am and at 12 noon on weekends. 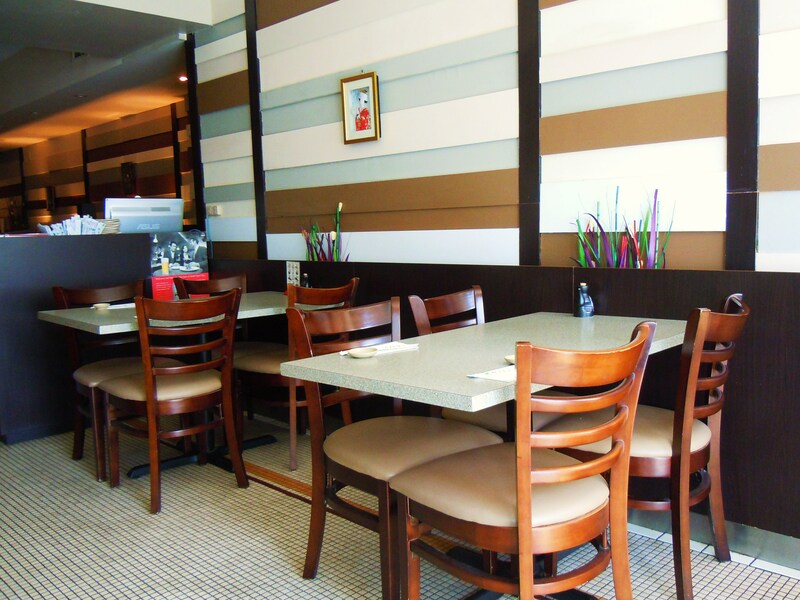 Their lunch specials are served from 11am-4pm. You can view their website and menu here. 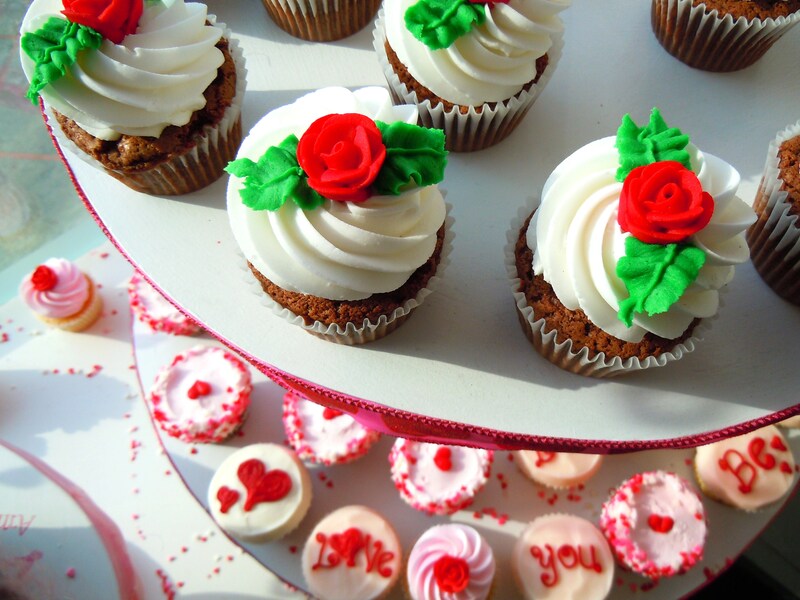 Mountains of Pink Frosting and Red Roses – Slow-Dancing With ‘Lady in Red’, and Valentine’s at Short & Sweet! 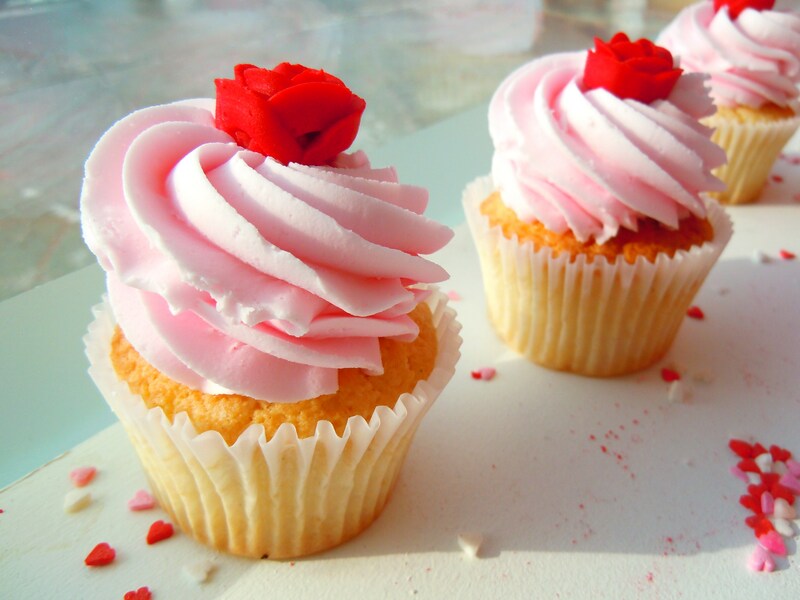 Fluffy mountains of pink frosting, bright red rosettes, heart shaped sprinkles and decorations adorning every corner and surface, and the intoxicating smell of fresh baked cupcakes that smell and taste like sweet spun sugar. 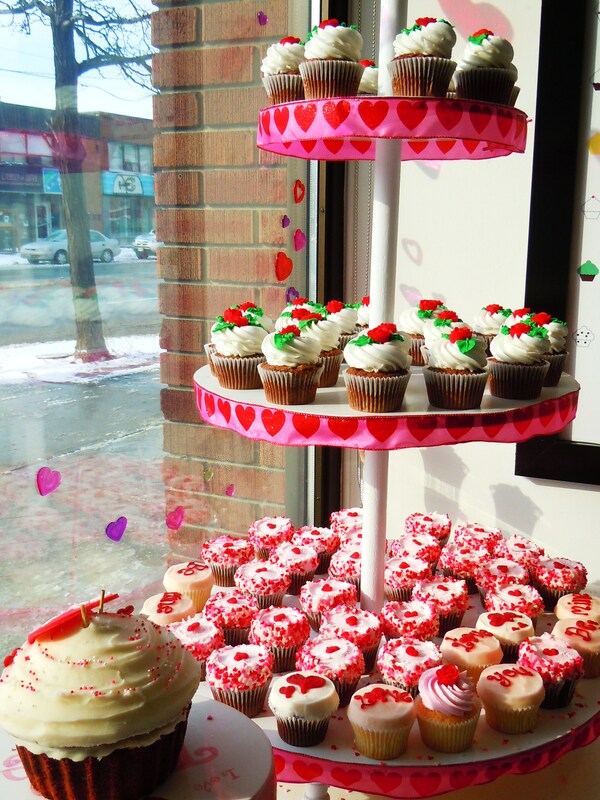 It’s Valentine’s pandemonium at Short & Sweet Cupcakes! Having sorely missed out on the holiday festivities back in December (I’m still recovering from the heartbreak), I’m back with a Valentine’s Day venegeance! 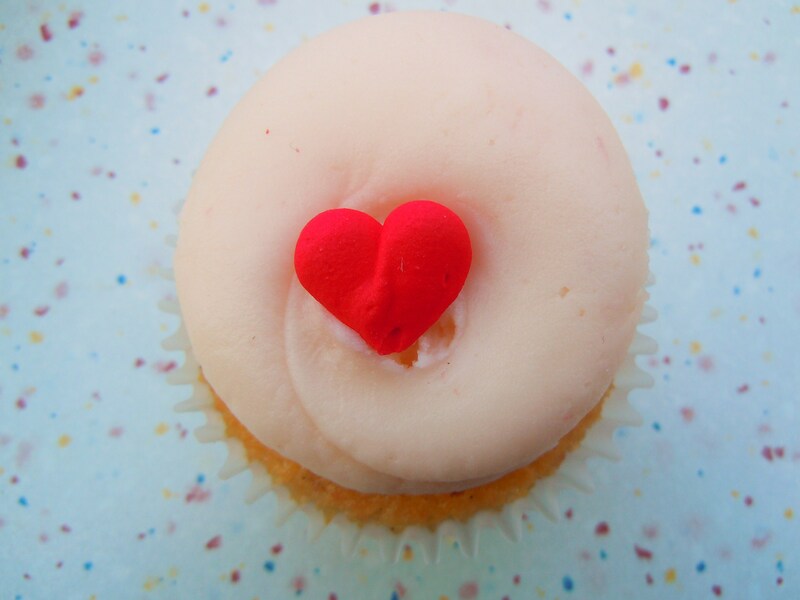 Short & Sweet has two very special Valentine’s Day promotions going on: the February Flavour of the Month, “Lady in Red” (cue Chris DeBurgh’s ’80s hit and the image of me slow-dancing with a giant cupcake) and the Valentine’s Day “Love Pack”! For those who want to pick up a quick Valentine’s cupcake on the go, the stunning strawberry Lady in Red ($2.90) is at your service! If you want something a little more extravagent and a little more razzle-dazzle, the Love Pack, featuring 12 delicious Valentine’s cupcakes is ready and willing to sweep you and your loved one(s) off your feet. The Love Pack ($40) includes 4 different flavours x 3 of each: 3 Lady in Red strawberry cupcakes, 3 chocolate, 3 vanilla, and 3 red velvet, all topped with Short & Sweet’s signature lickably sweet frosting and giant fondant heart toppers, sugar heart decorations, and sprinkles! 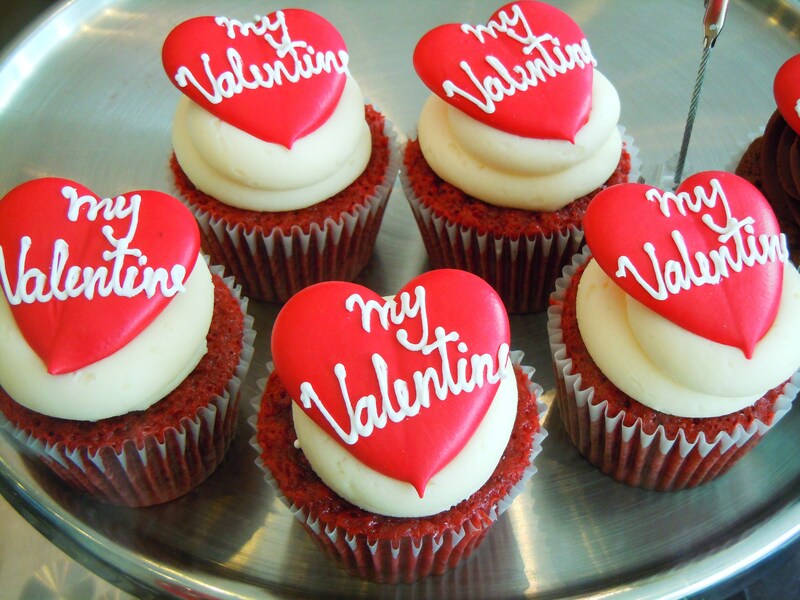 They’re also available to purchase as singles (with an extra $2 charge for the cupcakes with the great big heart fondant toppers) or in half dozen packs. One of the best things about Short & Sweet is their ever-changing storefront window display. Aside from the delicious, groan-inducing cupcakes, their gorgeous and elaborate window display is one constant that has followed Short & Sweet from their old location on Old Orchard Grove into their new location 3 blocks north on Avenue Rd. The window display reflects changes in season, special holidays and occasions, and new products such as their edible toppers, jumbo cupcakes (perfect for birthdays as a giant cupcake birthday cake! 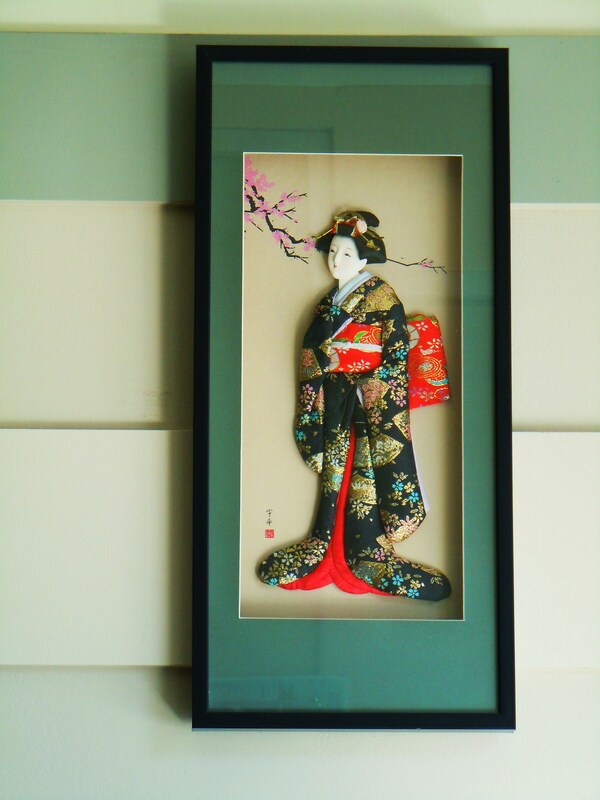 ), and custom designed creations. My favourite displays since I started coming here have been the Easter display (Easter dishes out my favourite colour palette) and the current Valentine’s Day one. 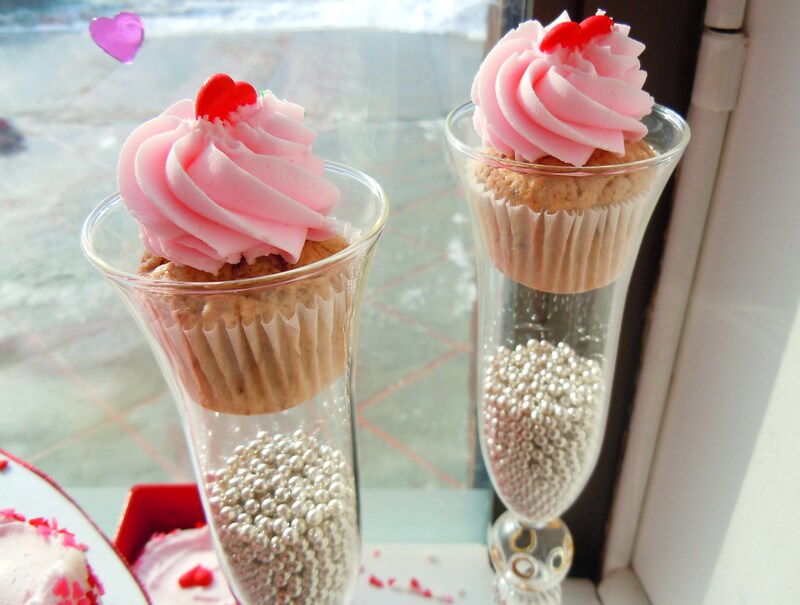 The Valentine’s one is so gorgeous and the whole concept is a cross between “I’m enjoying cupcakes and champage in a romantic sudsy, bubble bath” (check out the mini pink frosted cupcakes sitting daintily in the champagne flute-like glassware with silver edible pearls!) 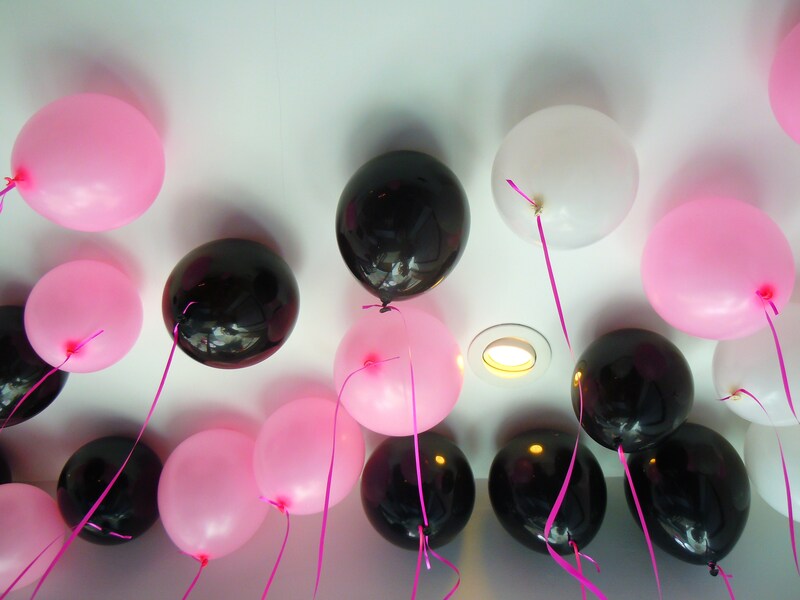 and “I want to celebrate everything lovey-dovey in red, pink, and white with hearts and roses”. The displays are always beautifully thought out and just mesmerizing to look at. 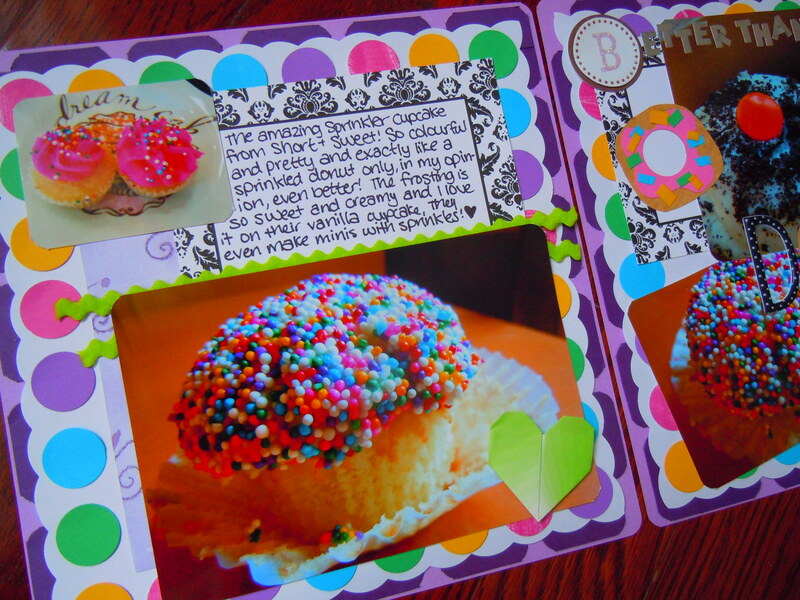 Now, a Short & Sweet post wouldn’t be a Short & Sweet post without a closer look at least one of the cupcakes. We’re cozying up with the fabulous Lady in Red cupcake and I do mean fabulous! Out of all the Flavour of the Month flavours I’ve tried, I loved the mint Oreo Mint Everest cupcake the most, but after devouring Lady in Red over the weekend, that Flavour of the Month favourite is now at a dead tie. Lady in Red is AMAZING. 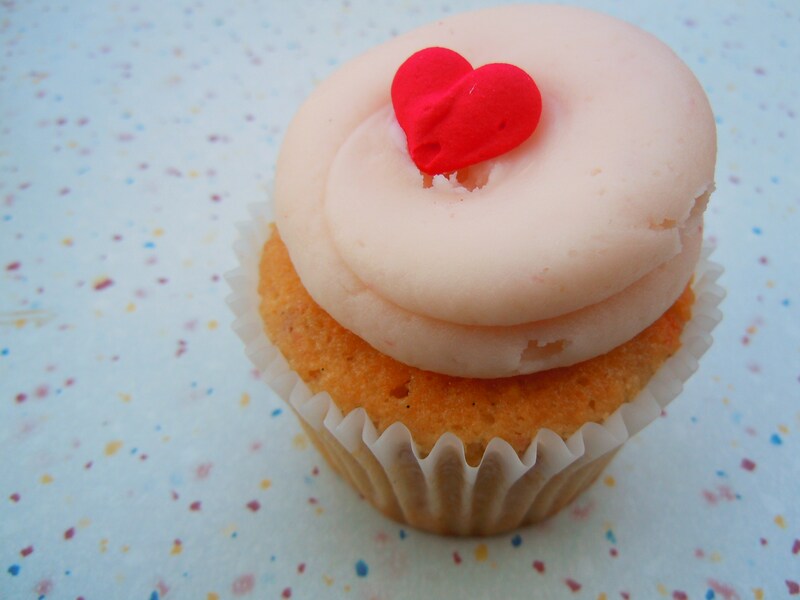 It’s a strawberry cupcake with strawberry frosting and a cute little red candy heart on top. I know, I know. It’s “just” strawberry. It’s not something exotic like durian. But it’s the simplicity itself that knocks it out of the park. 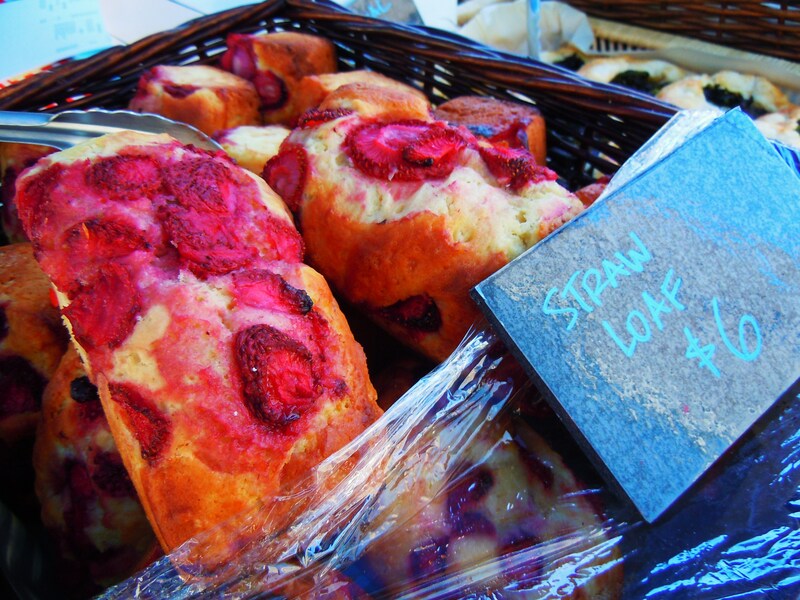 Just like lemon, the strawberry flavour can take on a number of different nuances. It can be tart, it can be juicy, it can taste more like strawberry ice cream, it can taste like strawberries and cream, it can be approached from so many angles. If Flour Studio’s strawberry cupcake tastes like strawberry Pocky and cream, Short & Sweet’s Lady in Red is a mesh of strawberries, vanilla, jam, sweet sugar, and shortcake. Even though the cake isn’t airy, the cake is very moist and full of flavour. The vanilla cake base looks like a mosaic of golden cake, strawberries, and jam and the thick frosting has this delicious, bold, sweet strawberry flavour that isn’t tart in the least. I like to think of it as a bolder, in-your-face version of strawberry shortcake. If it was up to me, I would have both the Mint Everest and the Lady in Red added to Short & Sweet’s permanent rotating menu because they are THAT amazing. Lady in Red has shot right up into my Top 3 favourite Short & Sweet cupcakes and it’s such a shame that it’s only around for the month of February. Maybe if I toot my horn loud and long enough, it might make an appearance on the permanment menu in the future, but for now, I can only look forward to the last two and a half weeks of the month and pine for the delicious strawberry cupcake after that. 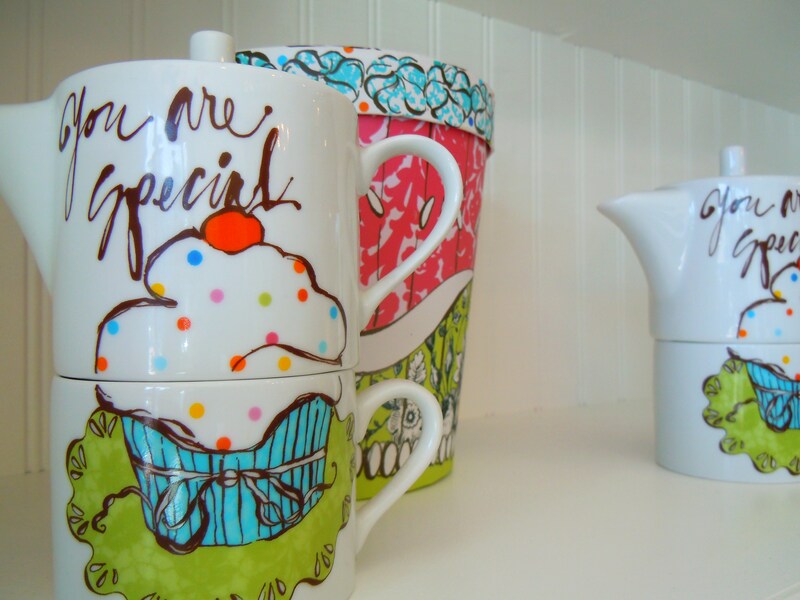 Short & Sweet Cupcakes is now located at 1945 Avenue Rd., south of Wilson Ave. They are open from 11am-6pm Tuesday-Saturday and 11am-5pm on Sundays. They are closed on Mondays. If you take public transit like me, the easiest way to get here is to get off at Wilson subway station and take the 96 bus to Avenue Rd. and walk south. You can also get here by getting off at York Mills subway station and taking the 165 Weston Rd. North bus to Wilson Ave. and Avenue Rd. and walking south, or taking the 61 Avenue Rd. North from Eglinton subway station. 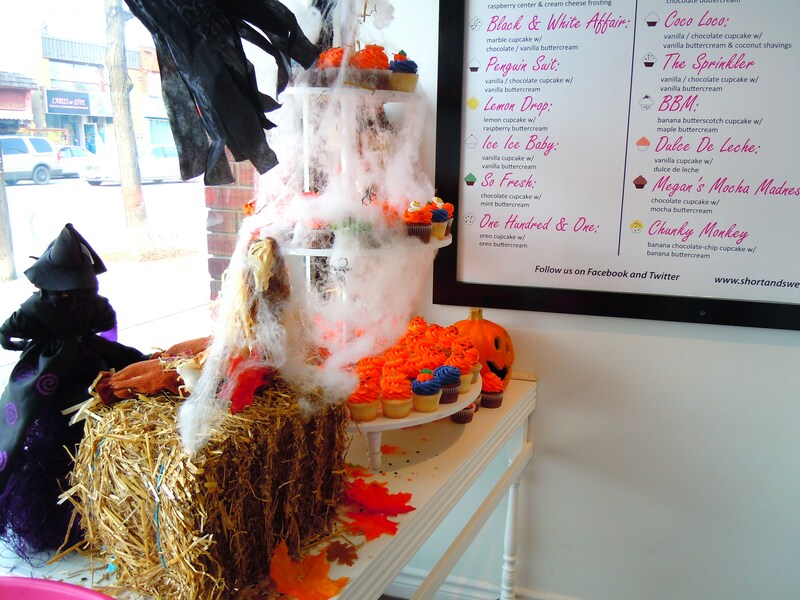 Hallowe’en Headquarters – A Frosted, Sprinkled Party of Orange, White, Purple & Black at Short & Sweet Cupcakes! Hallowe’en was a big deal for Short & Sweet for a number of reasons. First, it was the shop’s first major holiday celebration at the new location on Avenue Rd. Second, Hallowe’en fell on a Monday this year and Short & Sweet doesn’t normally open for business on Mondays, so it was a crazy, whirlwind day on their part! There are plenty of shops in the city that aren’t open 7 days a week and I can imagine what a pickle it becomes, as a business owner, when you’re faced with the dilemma of wanting to stay open for a specific holiday or occasion on the very day that you’re business is supposed to be closed. It’s the desire for more business versus possibly being short-staffed, majorly overworked, or just not having enough resources to accomodate. I’m biased, but I’m happy they decided to open this past Monday! While I was drooling over Short & Sweet’s special Hallowe’en themed cupcakes and snapping away with my camera, people were picking up orders left and right and I had to tell at least 4 or 5 people who came in after me that I was not, in fact, ordering (yet) and that they were more than welcome to go ahead of me. I was too busy gawking. Their selection of cupcakes were all sporting a mixed flurry of frosted, sprinkled orange, white, purple, and black and everything looked so pretty and festive! 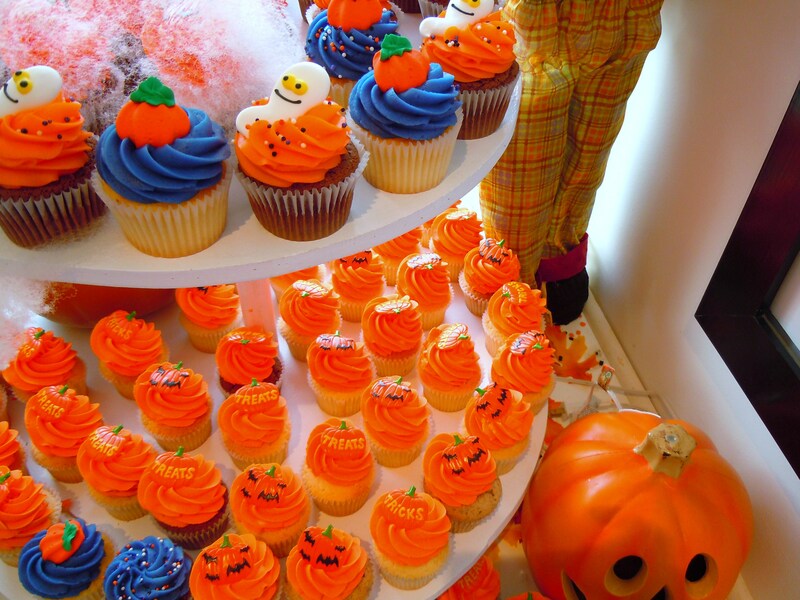 Some cupcakes had bright, rich, colourful frosting (Ice Ice Baby had a fiery orange vanilla frosting while Penguin Suit looked dapper in a gorgeous jeweltone purple with sprinkles) while others were dusted with orange, purple, black, and white sprinkles, pumpkin candy toppers, and Hallowe’en trinkets. 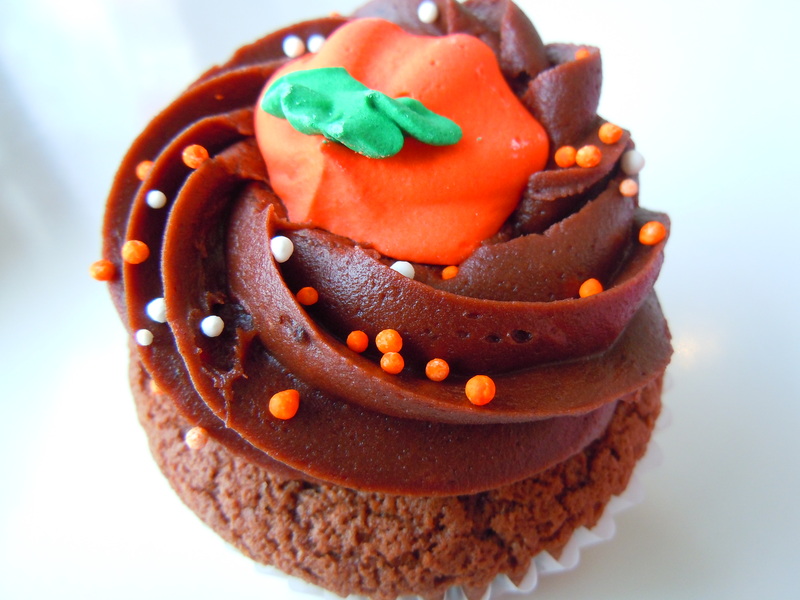 I picked up one for myself (October’s Pumpkin Spice with pumpkin spice cake and cream cheese frosting) and one for my brother (the chocolate, fudgy Rich in Recession with a Hallowe’en appropriate pumpkin candy on top) and good god did my brother ever go to town with his cupcake when I brought it home for him! 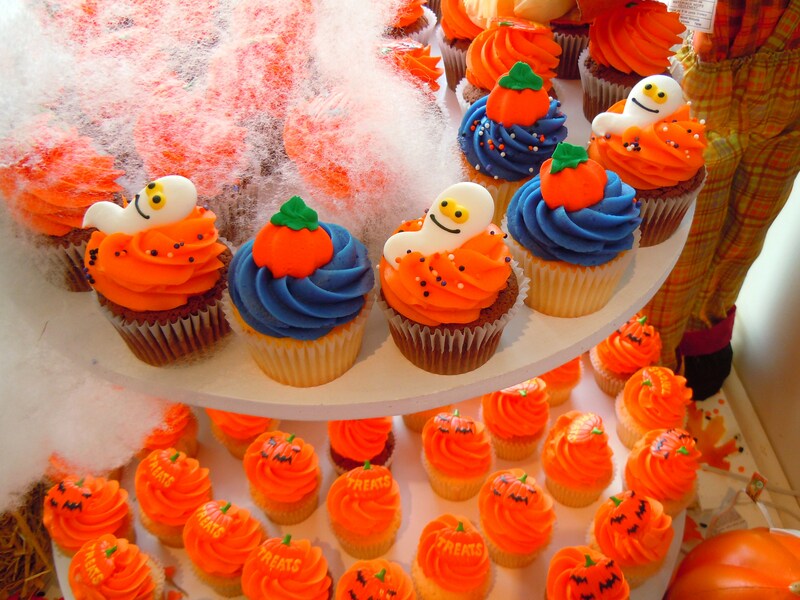 Forget trick-or-treating, cupcakes are where it’s at! My brother is a chocolate fiend and while he was stuffing his face, he managed to mumble out, “Mmm, chocolatey goodness, chocolate frosting is so good” in between mouthfuls of, well, chocolate. 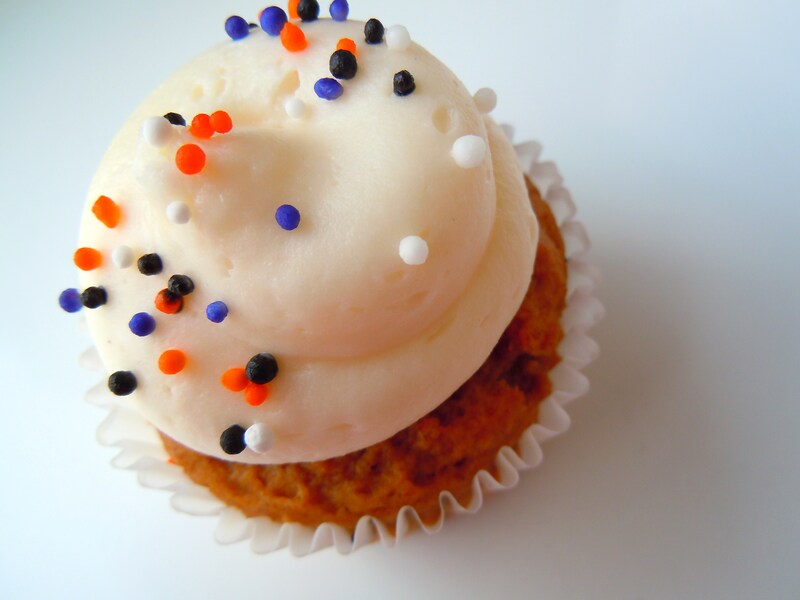 And my cream cheese frosted pumpkin spice cupcake was a mixture of sweetness, tangyness, and thick creaminess, which is a defining feature of Short & Sweet’s cupcakes. The frostings are thick and creamy and you’ll never find a frosting here that’s airy and whippy. The cake itself had an earthy, pumpkin flavour and the nice thing about it was that it wasn’t overloaded with the spice component. I enjoy spice combinations like cinnamon, nutmeg, cloves, 5-star, anise, etc. but too much makes the pumpkin flavour taste artificial. 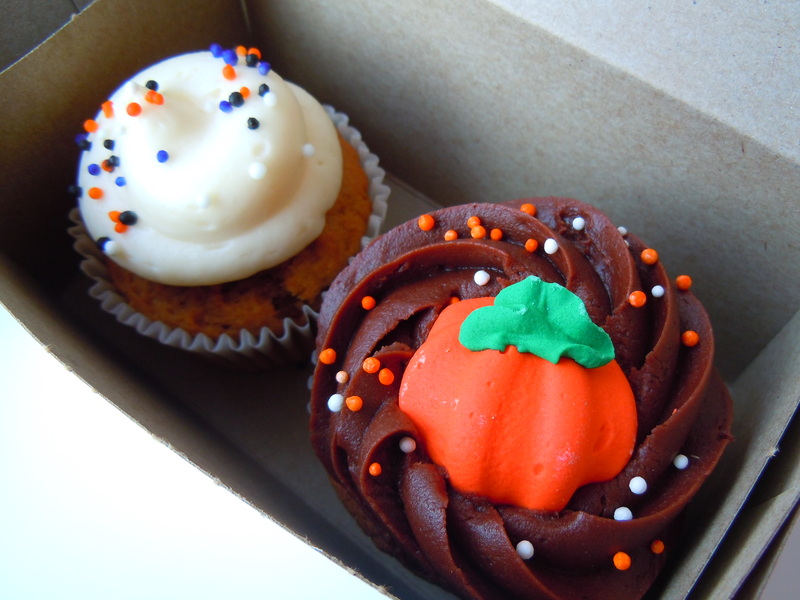 I don’t know what it is about pumpkin that makes the texture of cake so different, but pumpkin cupcakes are so different from the regular vanillas and chocolates. They’re not fluffy per se, and they’re not like muffins because muffins have more of a crumbly texture to them. 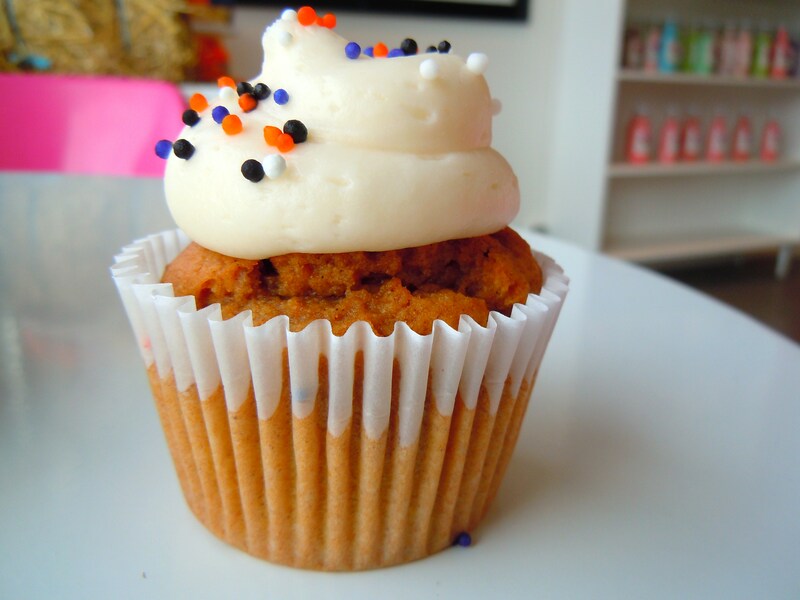 The pumpkin spice cupcake was so full of body. You feel like you’re eating a loaf cake with frosting and it’s the type of cake you can envision yourself having as a morning breakfast snack, or taking out of your oven in a loaf pan. I don’t mind one way or another, but if you prefer the “pillow” type of texture, the pumpkin cake probably isn’t for you. Even though the density of it takes some getting used to, I enjoy the flavour and I’m happy I got the chance to try it! Hallowe’en at Short & Sweet was super fun and this whole series was a blast to do. I hope you all liked the series, as short as it was, and had fabulous Hallowe’ens! November is now upon us and there’s so much to look forward to. I’m excited to churn out more Fall Harvest posts and I have a few holiday ideas up my sleeve as well! If you have any leftover Hallowe’en sweets, enjoy them! 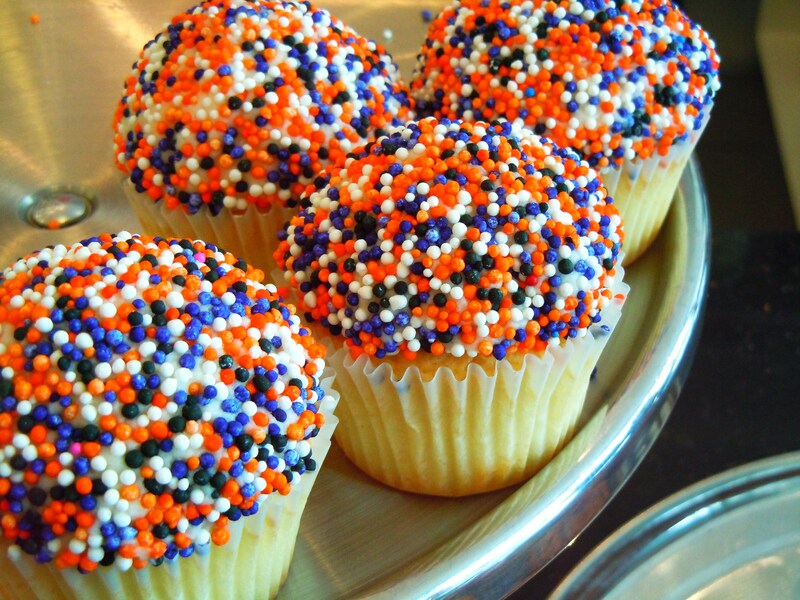 Short & Sweet Cupcakes is now located at 1945 Avenue Rd., south of Wilson Ave. If you take public transit like me, the easiest way to get here is to get off at Wilson subway station and take the 96 bus to Avenue Rd. and walk south. You can also get here by getting off at York Mills subway station and taking the 165 Weston Rd. North bus to Wilson Ave. and Avenue Rd. and walking south, or getting off Yorks Mills subway station and walking west to Avenue Rd. from Yonge. 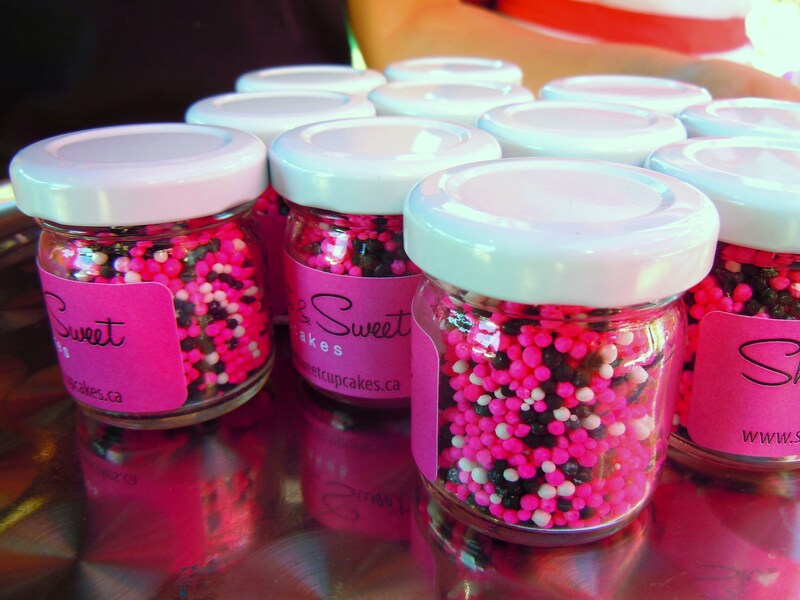 Pink & Black Balloons, Mini Cupcakes, and Lots of Sprinkles – It’s a Cupcake Party in Short & Sweet’s New Digs! 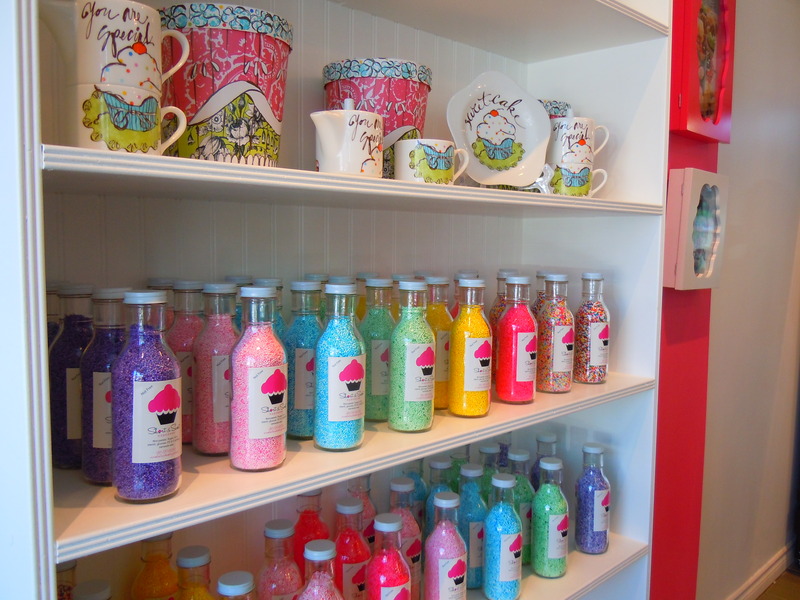 Those gorgeous, colourful glass bottles of cake sprinkles might as well have been happy pills because happy is definitely what was in the air last weekend at Short & Sweet Cupcakes new shop on Avenue Road! To celebrate their relocation and successful move, Short & Sweet threw a fabulous cupcake party chocked full of giveaways, free drinks, and free cupcakes last Saturday afternoon as a way of thanks to everyone who has supported the cupcake bakery since its sweet beginnings back in 2009. The new shop looks great and I’m so happy I get to show you all some photos of their new space! For one thing, it’s bigger. 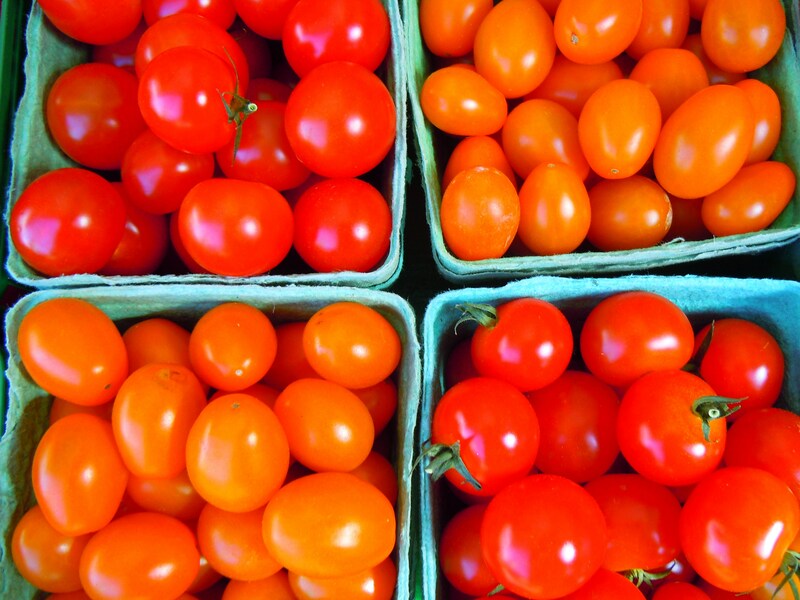 Gone are the squish-squishes and apologetic “excuse me’s” as you elbow a fellow customer. I would discourage you from doing cartwheels in the shop, but just know that it’s physically possible to do so now with the increase in square footage. There’s much more standing room and to my delight, there’s a bit of seating now! A few tables with chairs in Short & Sweet’s signature bright pink are available outside and inside should you wish to enjoy your cupcake on the premises. And believe me, you can bet I’m going to take advantage of this for photography purposes! I can’t tell you how many times I’ve run around in vain, in general, with a cupcake (or more) trying to find a suitable location to photograph it before it 1) melts or 2) gets squished or lopsided in transit. I’ve been really lucky in finding some great spots to model my cupcakes during for their photoshoots and runaway frosting shows, but I’ll always take the seating in the cupcakeries themselves over all other options any day. I know, I lead a tough life. As well, you can now admire their ever-changing window displays up close. The old location had a half-wall type of glass barrier around it due to the shop’s tighter space; no fear of accidentally crashing it into now! Finally, you can pick up a drink while you’re here and puruse through some of Short & Sweet’s kitchen and cake decorating wares on a floor-to-ceiling shelf filled with cupcake dishes and table accessories, rows and rows of bottled sprinkles in every colour of the rainbow, and some non-cupcake goodies including chocolate covered Oreos with sprinkles! 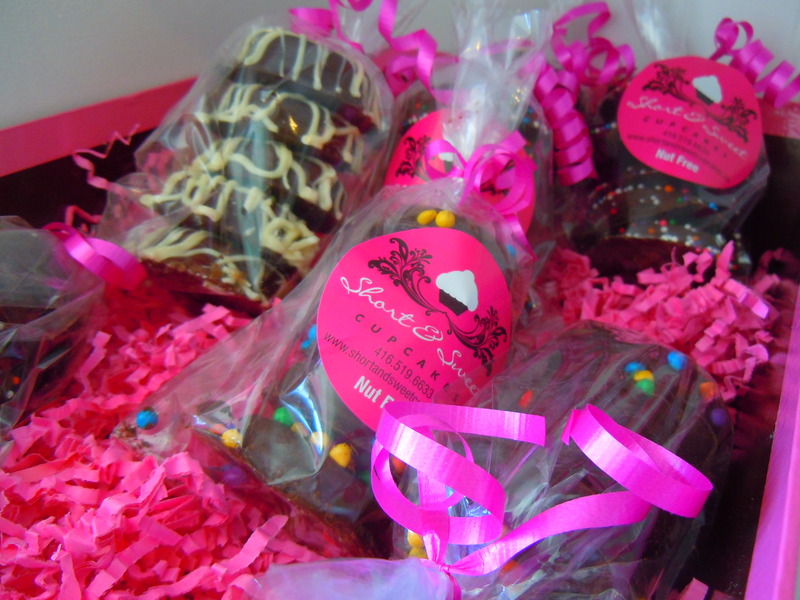 Short & Sweet has been experimenting with some new products and the cellophane wrapped packages of chocolate covered, decorated Oreos are the first to make their appearance. Not only was I here to join the party, but I was also there to get my first taste of Short & Sweet on a weekend. This was the first time I visited the shop on a Saturday so I got to see so many cupcakes I hadn’t seen prior to that day! 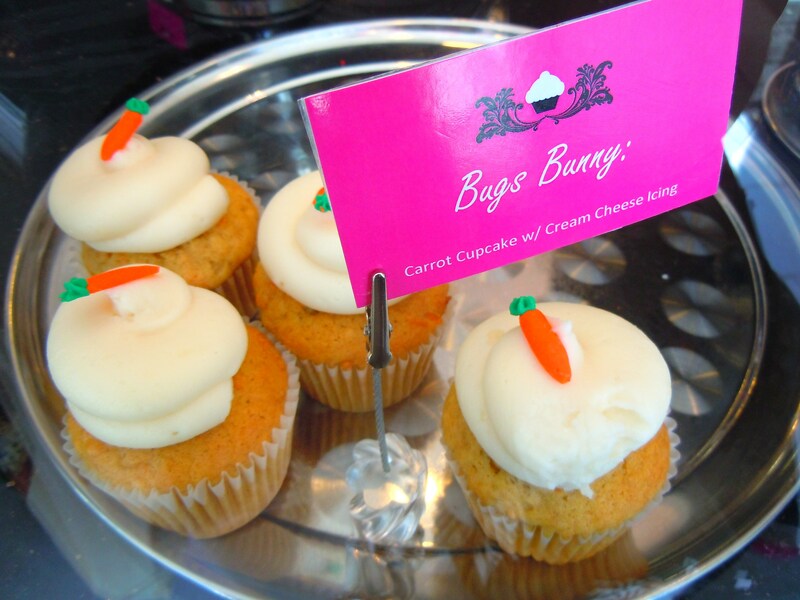 They have the largest selection of flavours on Saturday with Friday and Sunday following closely behind, so I was the given the joy of drooling over the Bugs Bunny carrot cupcake with cream cheese icing (and a very cute icing carrot! 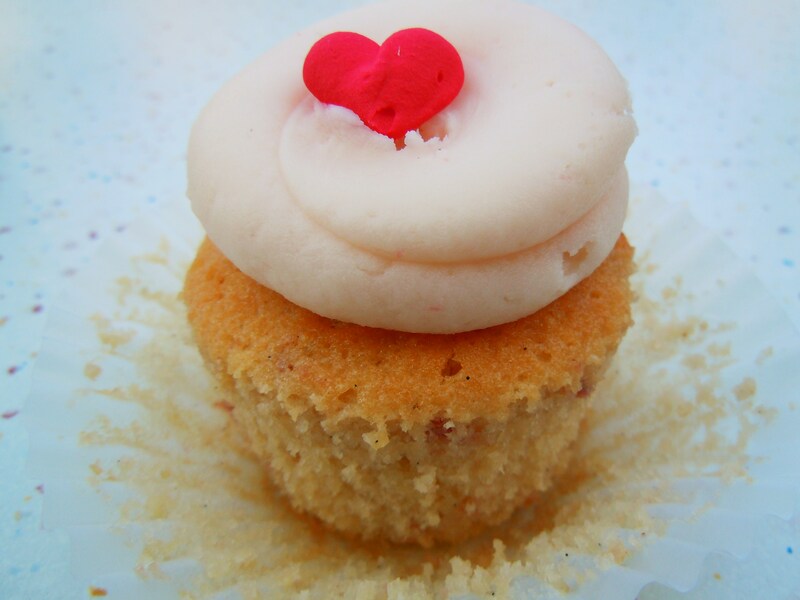 ), the sweet and sticky Dolce de Leche, the gorgeous sweet and citrusy Lemon Drop with its lemon cake, raspberry frosting, and lemon jube-jube candy, and the caramel-filled Caramela Soprano cupcake with its decadent caramel drizzle. As weird as it sounds, being here on the weekend for the first time reminded me of my time working at Claire’s years ago. To many managers’ chagrin, it was required for all managers to work one Sunday a month (as assistant, I often came in two Sundays a month) and the reasoning behind this was so that all workers would be acquainted with how business was on a Sunday versus the expected busyness of a Saturday, and the routine run-of-the-mill work week. In a nutshell, the arrangement is meant to gather information on sales and differences between different days of the week. Given how I had never been to Short & Sweet on a weekend before, there was definitely a different buzz in the shop, one that I hadn’t been accustomed to until that point. 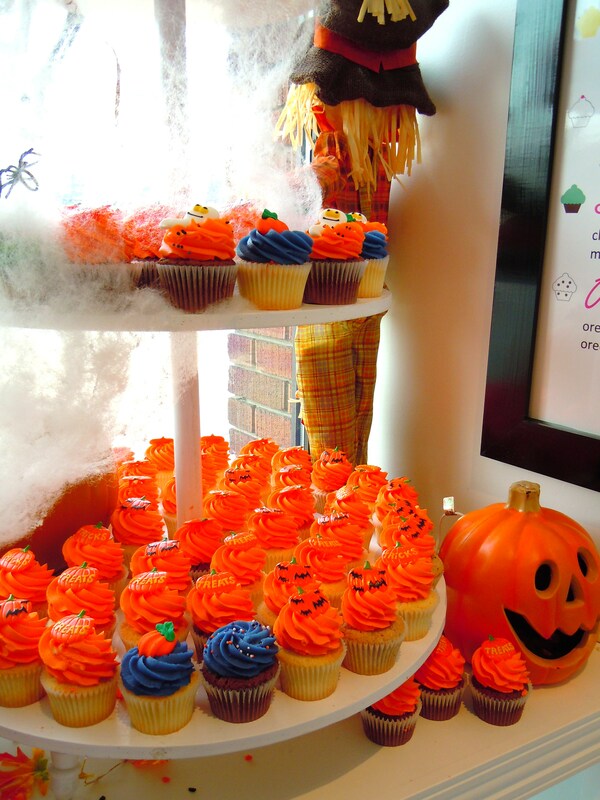 I’m sure the party had something to do with the excitement billowing around, but everything was faster-paced as the door kept opening and closing and as cupcake stands were refilled moments after they were refilled before. I’m sure a lot of you understand the feeling I’m talking about if you’ve ever stuck to a particular time of day or part of the week for certain activties. It was very cool being part of the weekend crowd and if their selection of cupcake is any indication, I’ll have to set some time aside to make more trips on Fridays, Saturdays, and Sundays! It was a beautiful, warm day and the shop was hopping with people enjoying the party both inside and outside, sipping drinks from the Jones soda booth, noshing on platters of mini frosted cupcakes (vanilla, carrot, red velvet, and apple cinnamon), and taking away a Short & Sweet jar of special pink and black sprinkles as a souvenir. You can see why I had to play it safe at the Vegetarian Food Fair earlier that day now, right? It was a balancing act of epic proportions, but I wouldn’t have wanted it any other way because I got the chance to enjoy two very amazing foodie events, on the same day no less. Even Better Than a Donut – The Rainbow Bright Sprinkler Cupcake from Short & Sweet Cupcakes! 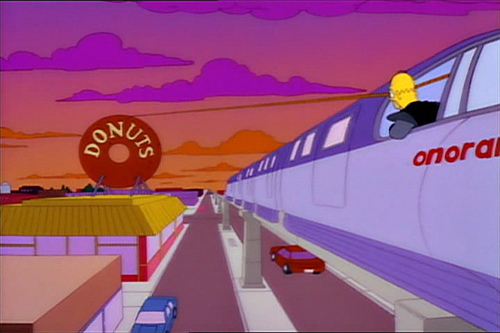 “Donuts, is there anything they can’t do?” asks Homer at the end of Marge vs. the Monorail. I love this Simpsons episode to pieces (who doesn’t?!) and although I enjoy donuts and have quite a few favourites and weaknesses, I have to counter that question and respond with a “yes”. 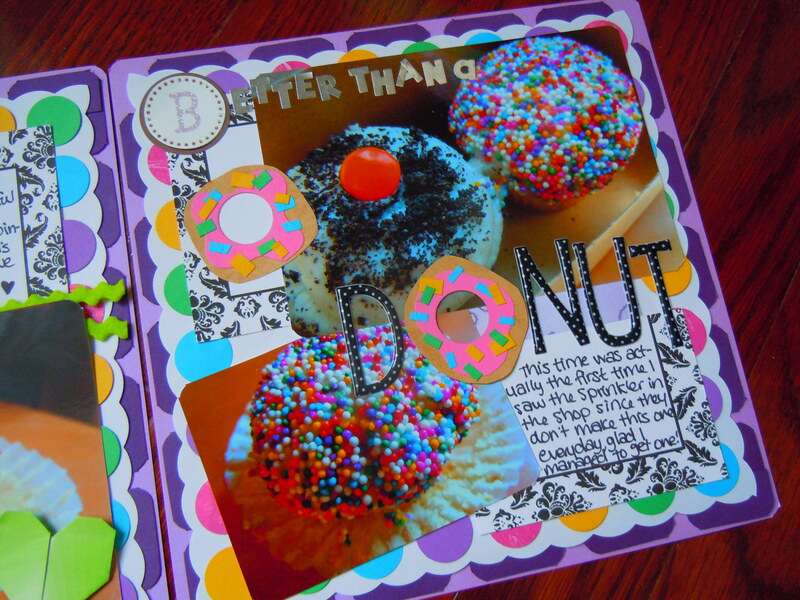 Because a donut can’t be a cupcake and it certainly can’t be the Sprinkler from Short & Sweet Cupcakes! You all know that Short & Sweet is my holy grail for cupcakes in Toronto and you all know I have made many a visit since my first one in the spring. However, there are still cupcakes that I haven’t actually seen in person and this is because their cupcake selection operates on a routine rotating basis. Wait, routine and rotating in the same sentence? How does that make sense? Let me explain. 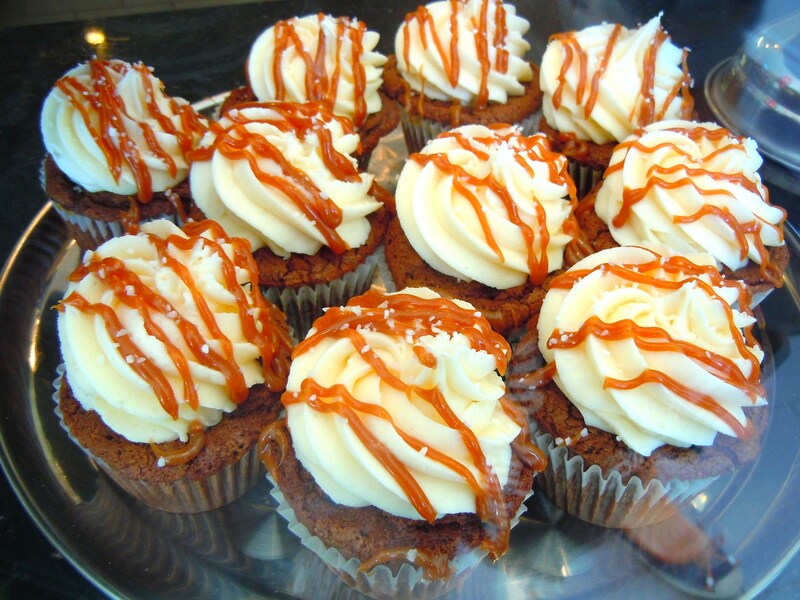 Short & Sweet has a slightly different selection of cupcakes every day during the week and they go ALL OUT on the weekends, nearly doubling their selection compared to, say, Tuesday. What you see on Tuesday is what you will see EVERY Tuesday. And what you see on Thursday, for example, is what you can expect to see the next Thursday. Followng me so far? 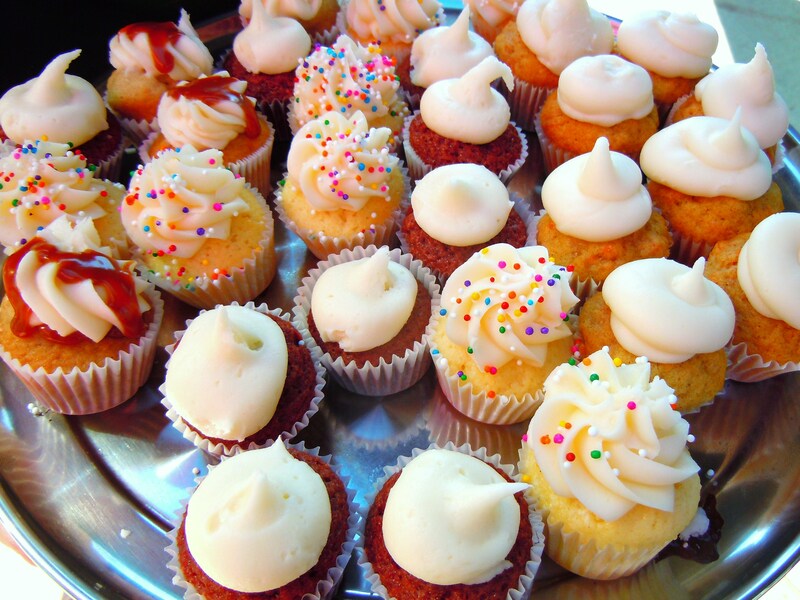 There are certain cupcakes that are available every day and certain ones that only make their appearance once a week or during the weekend. 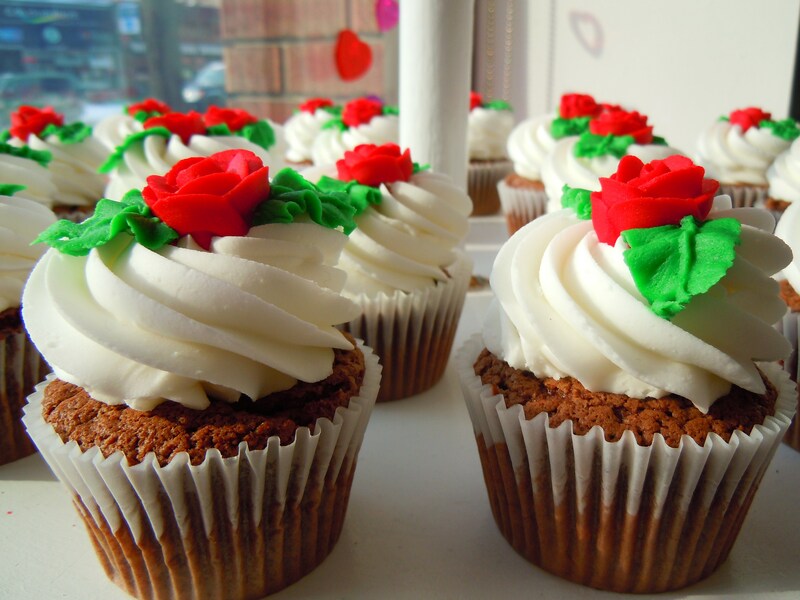 Depending on which day(s) you frequent the shop then, there could be cupcakes that you’d miss completely and this has certainly been the case for me. I’m accumstomed to visiting the shop during the week, most of time in the middle of the week on Tuesday or Wednesday (they’re closed on Mondays). This is why, on this particular Thursday back in July, I finally saw the Sprinkler up close and in person and there was no way I was going to leave the shop without this pretty little thing. 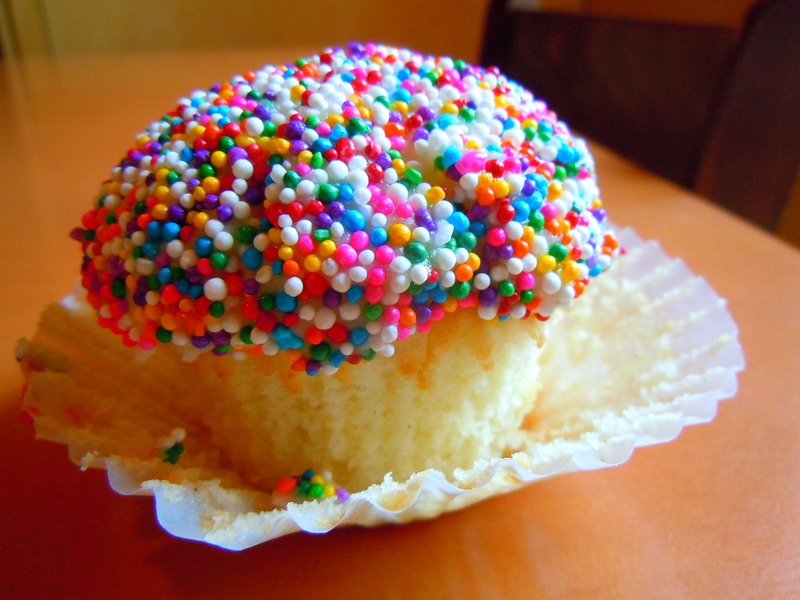 A cupcake that looks exactly like a rainbow sprinkled, technicolour donut?! YES PLEASE. Everyone feels differently about sprinkles though. My dad, for instance, hates sprinkles with a passion because he has bad teeth. He’s had issues with his teeth for years now and because of their current condition, things like sprinkles get stuck between them and I think they’re even susceptible to cracking given how crunchy sprinkles are! Some find them messy and others are kind of indifferent about them. 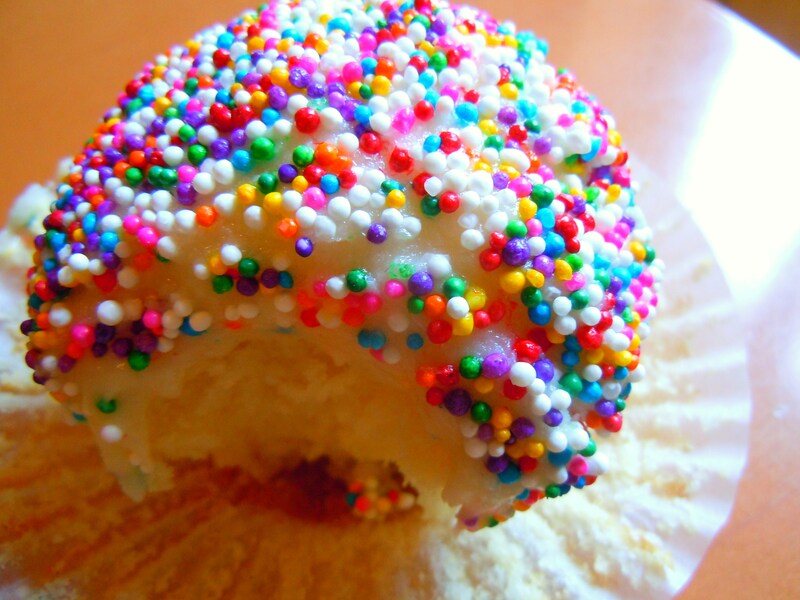 I, on the other hand, LOVE sprinkles and I always have. Tubular ones, tiny round balls, crystal sprinkles, cute shapes, I adore them all and I think that they add so much character and fun to desserts. 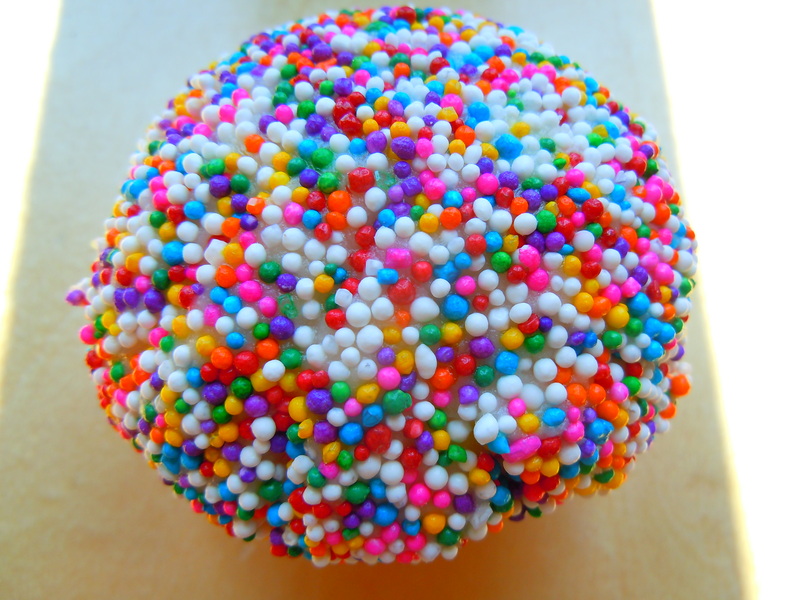 I get rainbow sprinkles and chocolate sprinkles on my ice cream and soft serve, I adore sprinkles in my shortbread cookies, and I get giddy at the thought of dunking a frosted cupcake into a bowl of sprinkles and having the sprinkles stick all nice and pretty to it. 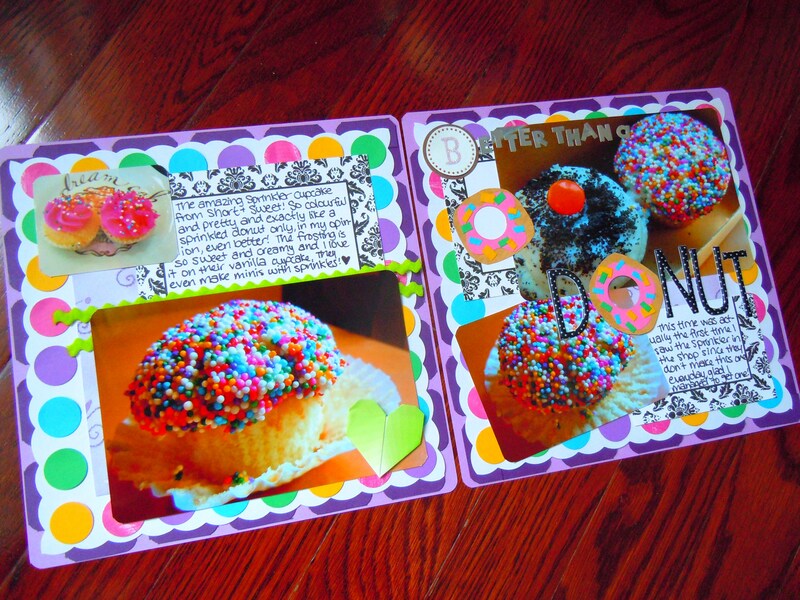 If you love sprinkles and you’re a fan of sprinkled donuts, this was made for you. This is like a sprinkled donut only, in my opinion, 10x better! 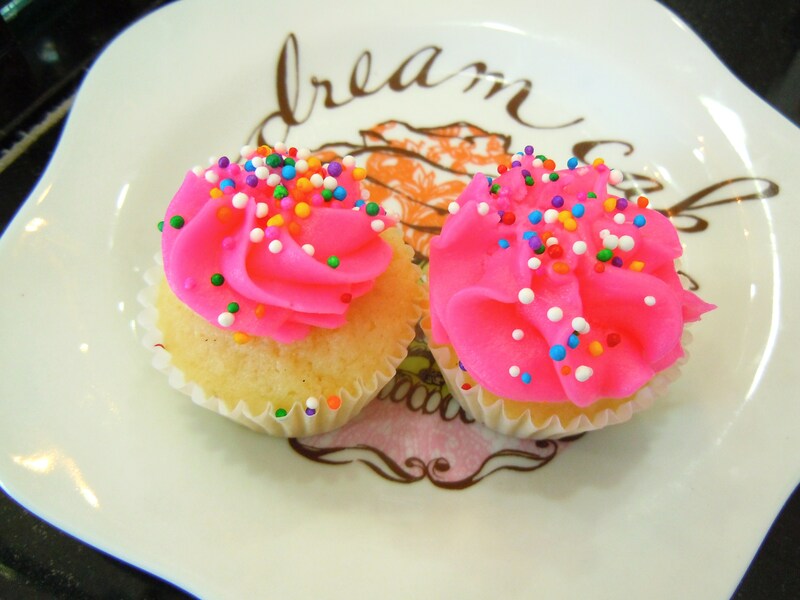 The vanilla cupcake is soft, moist, and sweet and the frosting with the sprinkles is just out of this world. You know how sprinkled donuts have that layer of sweet frosted glaze that helps the sprinkles stay on? Imagine that sweetness but in the form of a thick, super creamy, lickably good frosting. 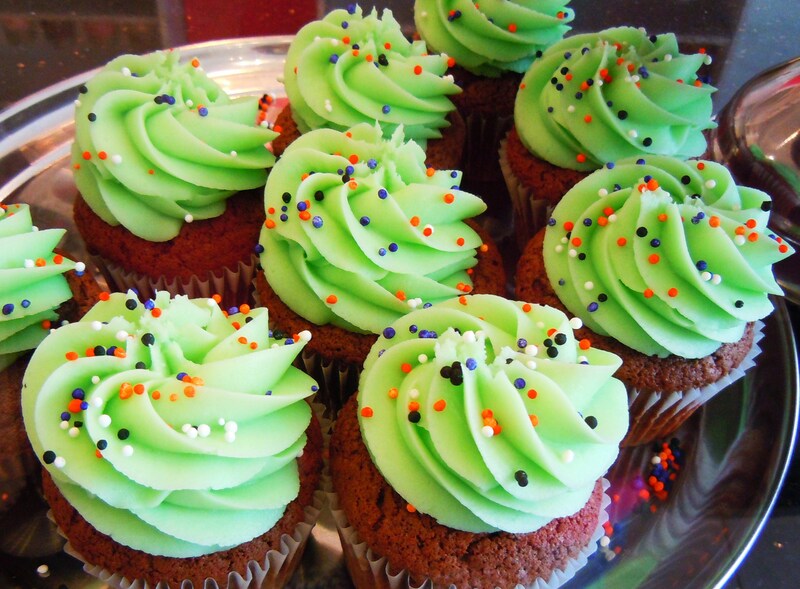 The kind of frosting that makes you want to dip your finger in it and go to town. The Sprinkler is like a donut, birthday cake, and whipped frosting straight from the mixing bowl all wrapped in one. I made an absolute mess of myself with the frosting drooping down my cupcake and some of the sprinkles bouncing away after the first bite, but it was so worth it. It’s fun, colourful, and so perfect for the kid in all of us. Scrapbooking materials used: to be added.